This post was sponsored by Heluva Good! Cheese as part of an Influence Central campaign and all opinions expressed in my post are my own. 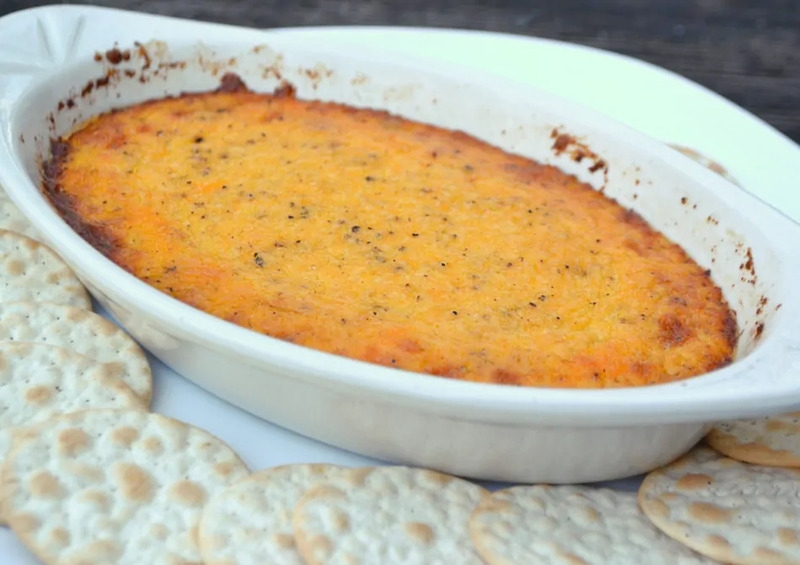 This quick, simple and delicious Baked Cheddar & Black Pepper Spread takes only four ingredients and just a few minutes to put together! I entertain a lot. Holidays, football games, cookouts – we always have company. We also have a lot of unplanned, drop in kind of company. Either or, I’m always ready to host – I love it! There are foods I always have on hand for company. Cheese is on top of the list. A simple cheese tray is always a hit – and tends to be the first thing to be cleared off the table. 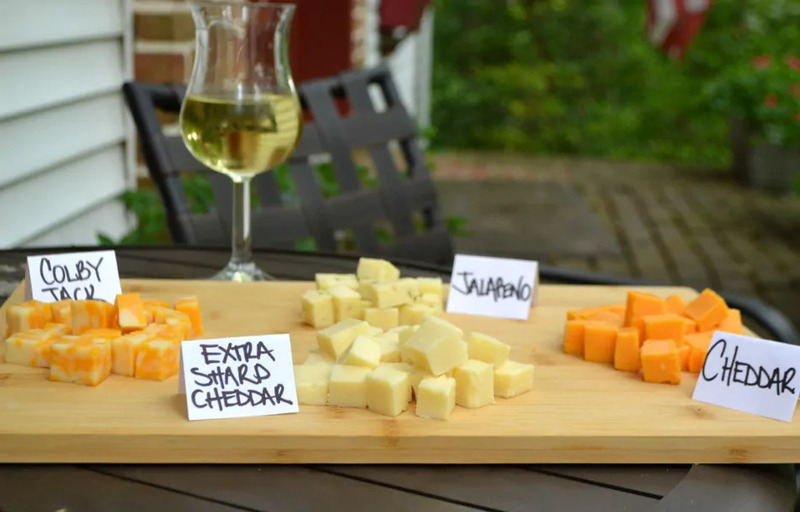 Besides a cheese tray, there are so many other options for quick, throw together hors d’oeuvres & bites to eat with the almighty cheese. 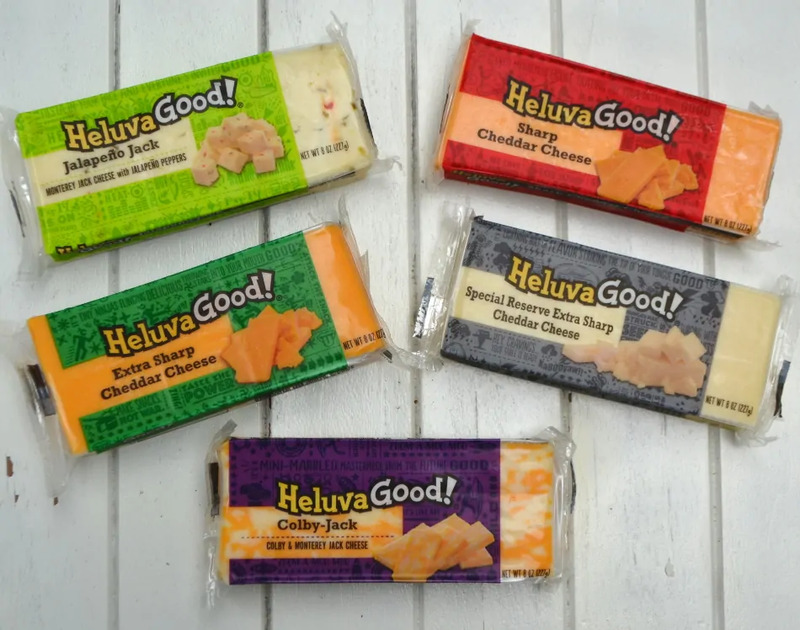 I LOVE and swear by Heluva Good!® Cheese. Heluva Good! Cheese blocks are always in my fridge – be it for daily snacks for the family or a part of a food spread for company. Heluva Good! Cheese is loaded with serious mouthwatering flavor. As always – it’s gluten free, made with real milk and a great source of protein and calcium! 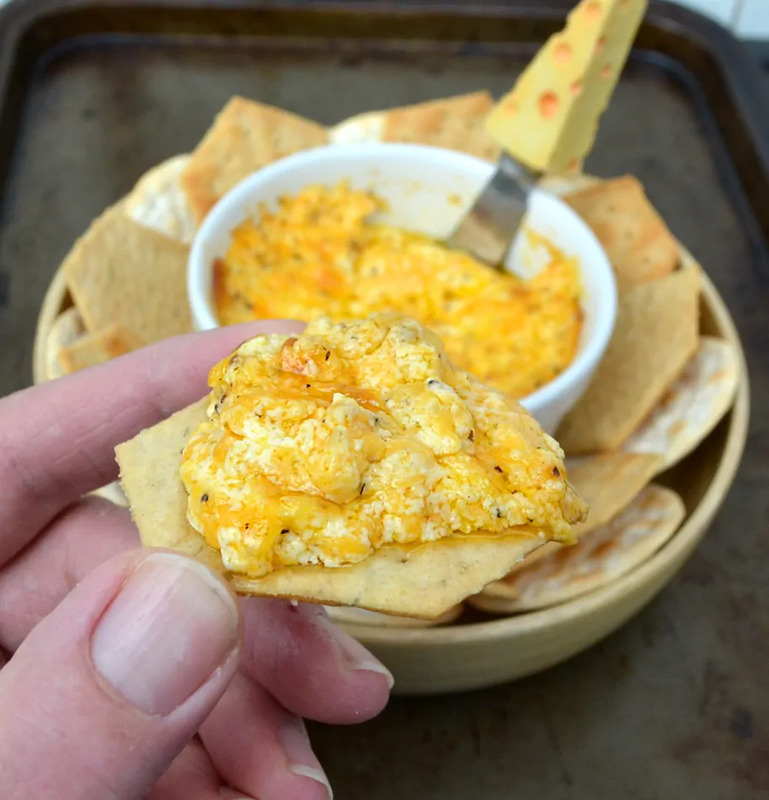 I have many, many cheesy recipes I make – but today I’m talking about just one. Warm Cheddar & Black Pepper Spread. It’s a simple recipe that focuses on just two flavors – cheddar cheese & black pepper. No spices, no dash of this or that – no distractions. This is the real deal here. 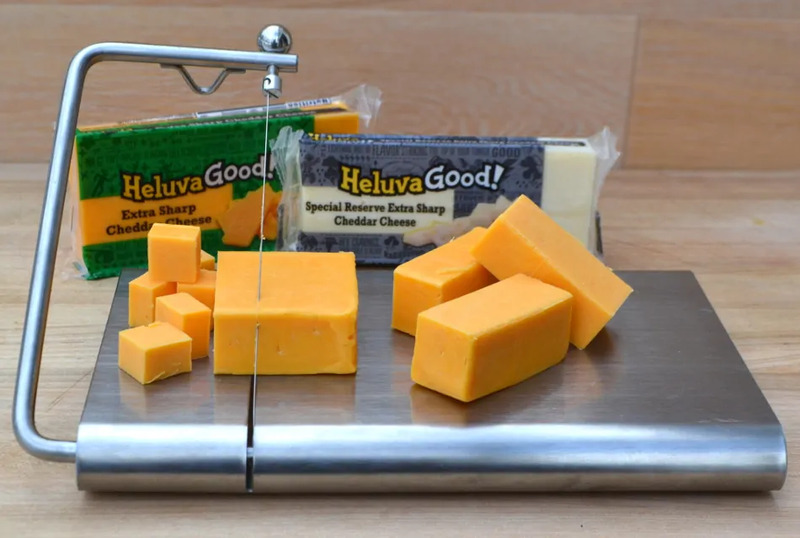 That being said – you want to use the best cheese – yup – Heluva Good! Cheese & a freshly ground black pepper. The combination of the two is unbelievably delicious. This spread couldn’t be any simpler to make. It takes only four ingredients and a few minutes to put together. Shred your cheese, grind in the black pepper and mix in real mayo (none of that sweet stuff) and sour cream. Throw it in the oven and bake until the top is lightly golden brown. This stuff will be like molten lava – so resist the temptation to dip right in. Let it sit for 10 minutes before serving. I serve this with crackers, hard pretzels, soft pretzels, baguette slices, pita slices – heck, I could eat it right off a spoon. I will also mention that this cheesy concoction is fabulous served over a juicy chicken breast – but that’s for another time. I always find a big selection of Heluva Good! Cheese at my local Walmart. They already have great prices – but now you can save even more! Head over to Ibotta to grab this deal now – limited quantities are available! Head over to Heluva Good! Cheese for all things cheese inspiration! Don’t forget to grab that Ibotta offer at Walmart! Preheat oven to 350°F. Lightly grease or spray an oven safe dish(es). Shred cheddar cheese in a mixing bowl. Grind in fresh ground black pepper, mix. Stir in mayo & sour cream until combined. Scrape mixture into greased dish. Bake for 15 - 20 minutes or until mixture is golden brown. Let rest at room temperature for 10 minutes. 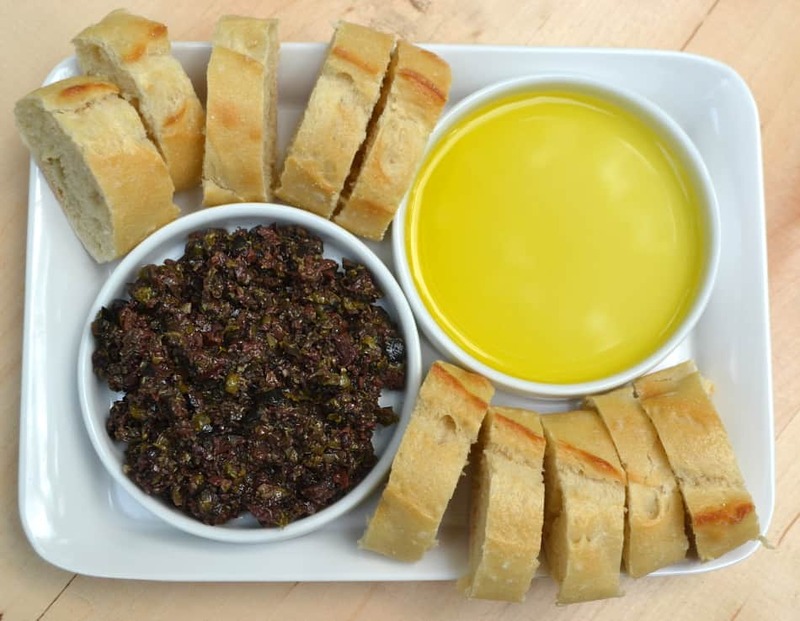 Serve with crackers, hard or soft pretzels, baguette slices, pita triangles and enjoy! This post has been sponsored by Pomora. All content, thoughts & opinions are always my own. This post contains affiliate links. 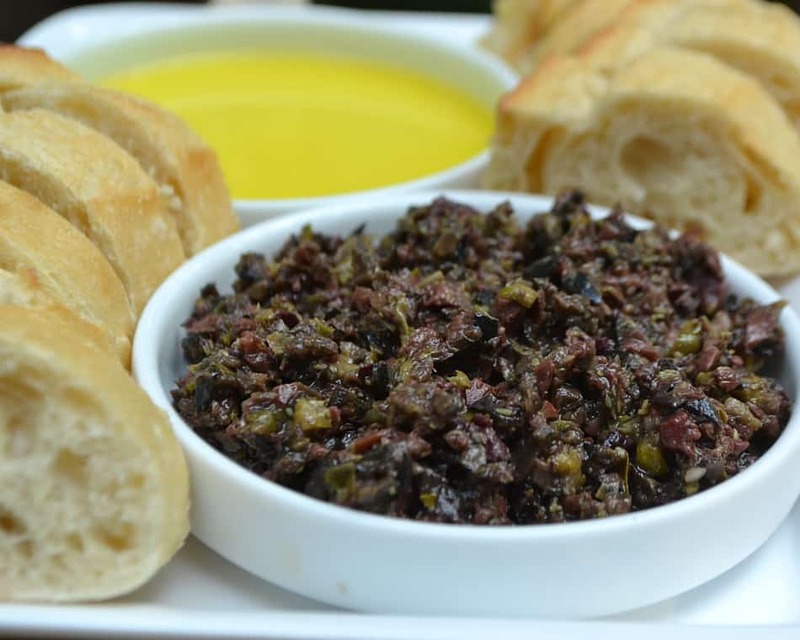 Try this simple & delicious Olive Tapenade made with black & kalamata olives, olive oil, capers, anchovies & garlic! Sometimes simple recipes can be so impressive. 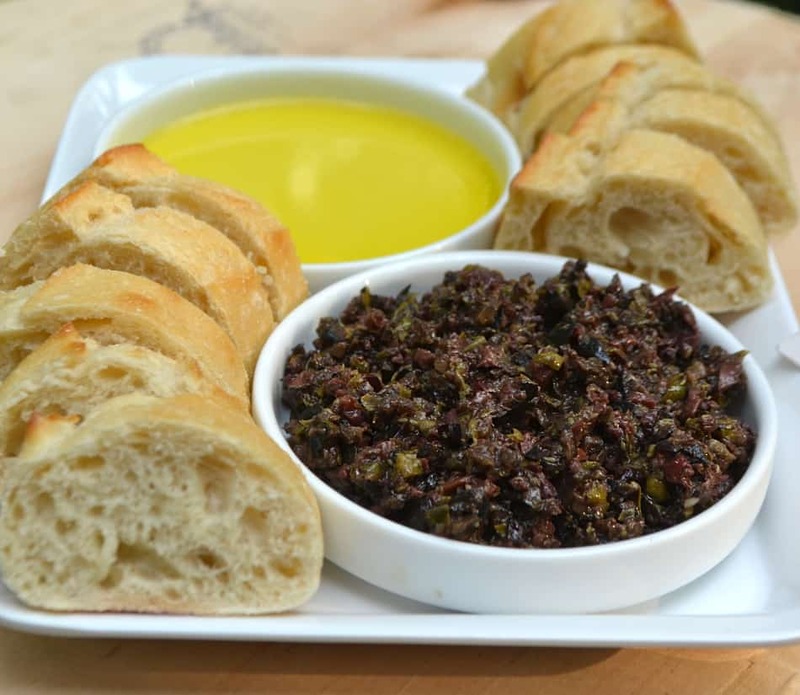 That’s certainly the case with this Olive Tapenade. I’ve always been an advocate of keeping things as simple as possible in the kitchen. Life is too busy, and too short for that matter, to be fussing over extensive ingredients on a daily basis. The key to great food made simple is keeping quality ingredients on hand. I always keep an assortment of good olives in my fridge and in my pantry. For snacking, for meals & for quick hors d’oeuvres. Olive oil. I thought I knew good olive oil. I always have quite a few bottles around – one for cooking, one for dipping, one for dressings. 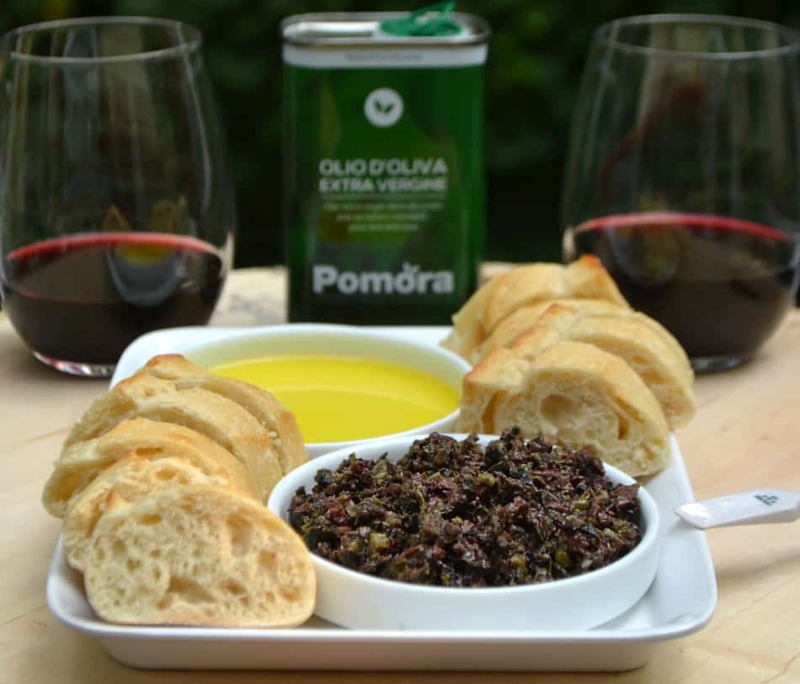 Then I was introduced to Pomora Olive Oil. I was a believer at first taste. The amount of depth & flavor in this oil – it’s like nothing I’ve tasted before. It’s safe to say there is no turning back for me. 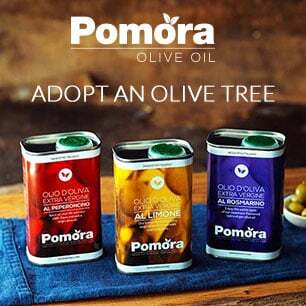 Pomora Olive Oils are my one and only. The quality and flavor is second to none. The story of the oils is just as beautiful…. 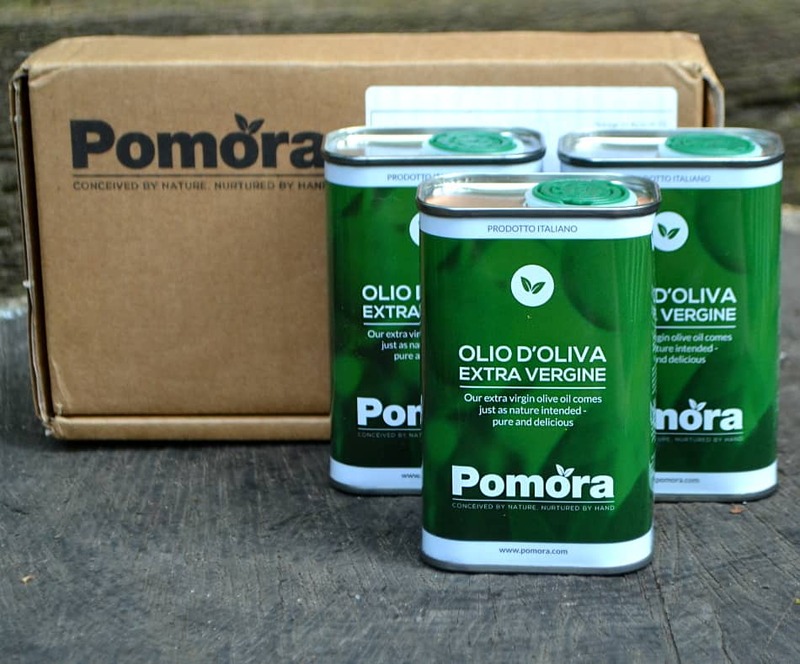 Pomora is committed to supporting small, independent growers. Their farmers have generations of experience behind them and employ traditional & sustainable farming methods. They respect the land which supports them and they take care of their employees! 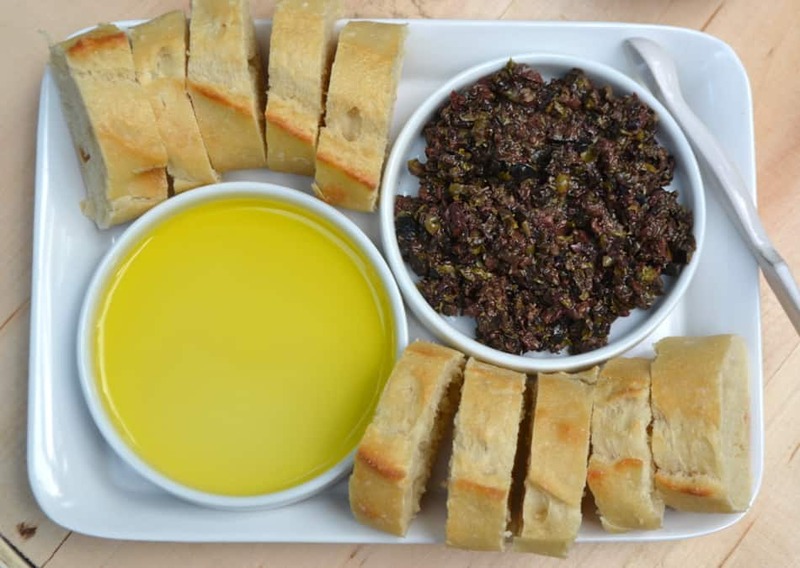 Make your olive oil count – of course I used Pomoro Olive Oil in this recipe and it makes all the difference. 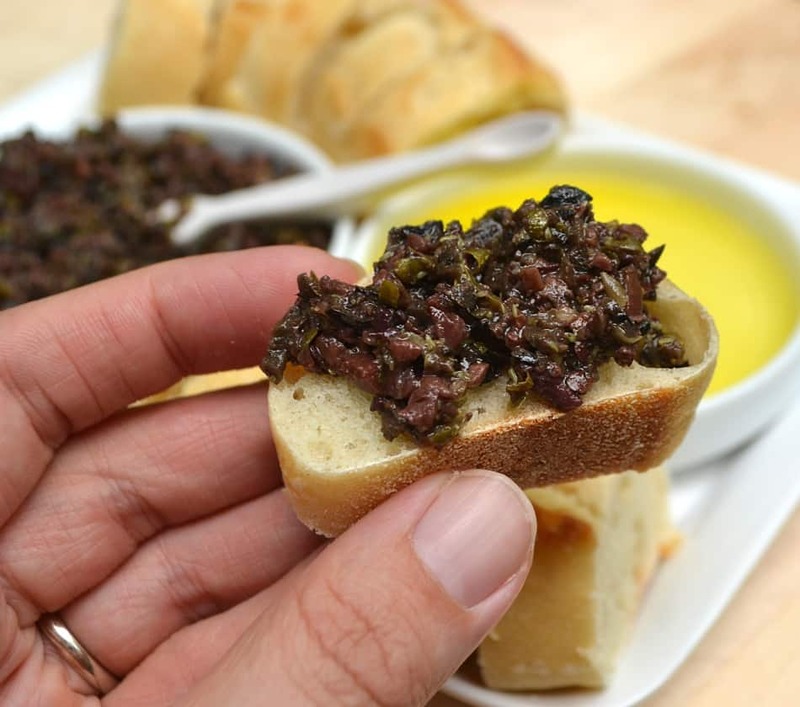 You’ll see I add anchovies to this tapenade. Trust me – add them. There is no fishy taste to this recipe – it just gives it that umami taste we all love but may not understand. So everything goes into a food processor. Pulse, scrape, pulse. Don’t over process it. Serve immediately or refrigerate until ready to serve. I made two batches – one coarser, one a bit more pureed. I suppose I preferred the one with a bit more texture, but both were so delicious I’m not sure I could choose a favorite. 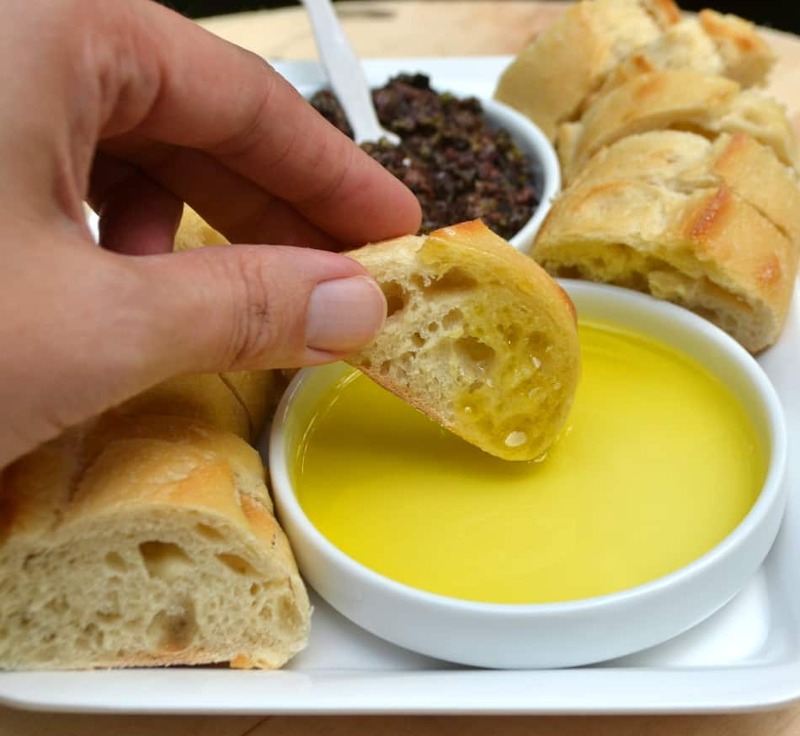 I love Pomoro Olive Oils for many reasons – but at the end of the day I most appreciate the flavor for dipping and drizzling. Enjoy this 100% pure olive oil and all it’s health benefits. Taste the difference! 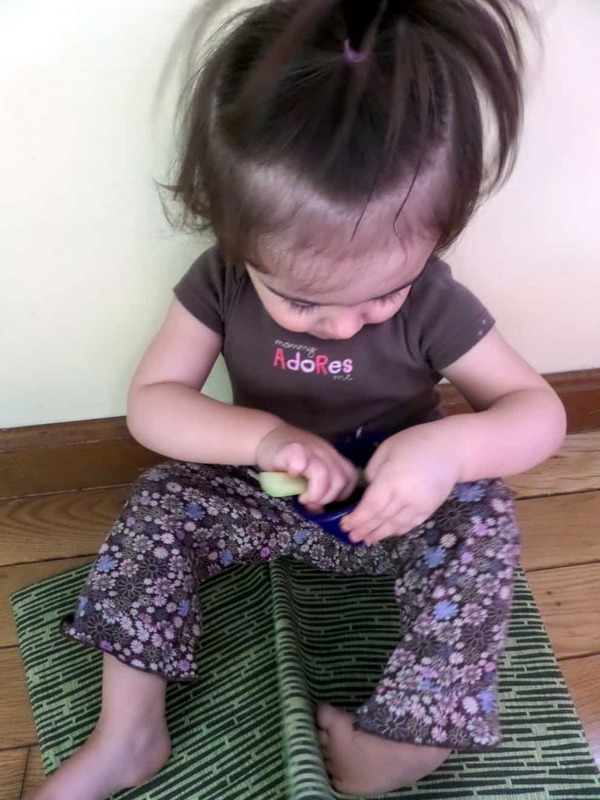 Click below to learn more about Pomora! Process until desired consistency, stopping to scrape down sides once or twice. Do not over process. 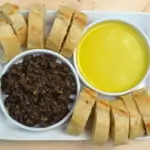 Serve immediately with baguette slices or good crackers or refrigerate until ready to serve. 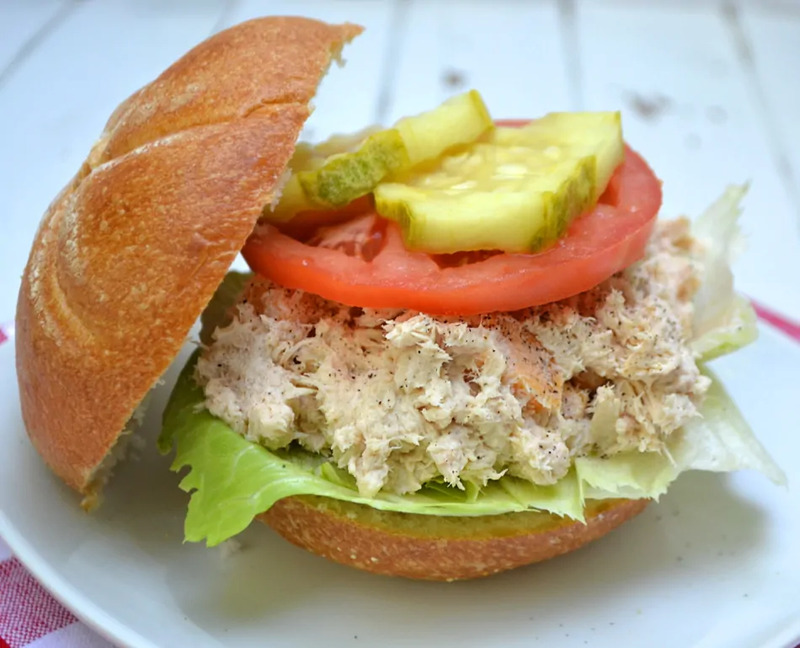 Try a simple twist on a classic recipe with this Cheesy Tuna Salad. Oh, cheese, how I love you. Let me count just a few of the ways…. 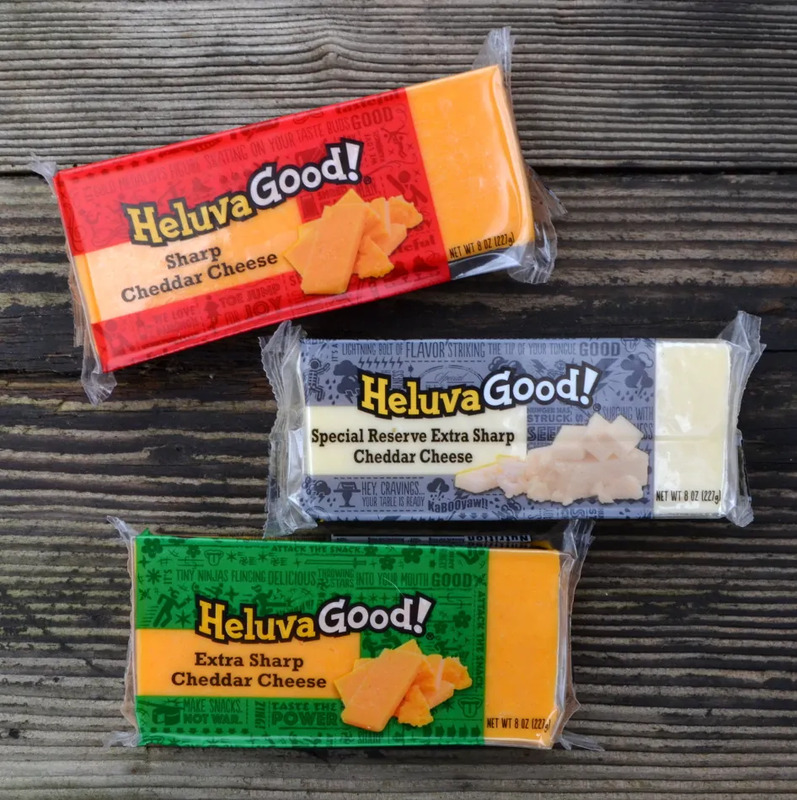 Heluva Good!® Cheese, with all it’s delicious flavors, keeps my cheese snacking and serving exciting. Let’s start it off simple. You can NEVER go wrong with a cheese board. Served simply, in perfect bite-sized cubes. With company, accompanied by snacks and drinks – cheese stands out as the one. Paired with fresh summer veggies, pickled goodies, cheese is still the one. 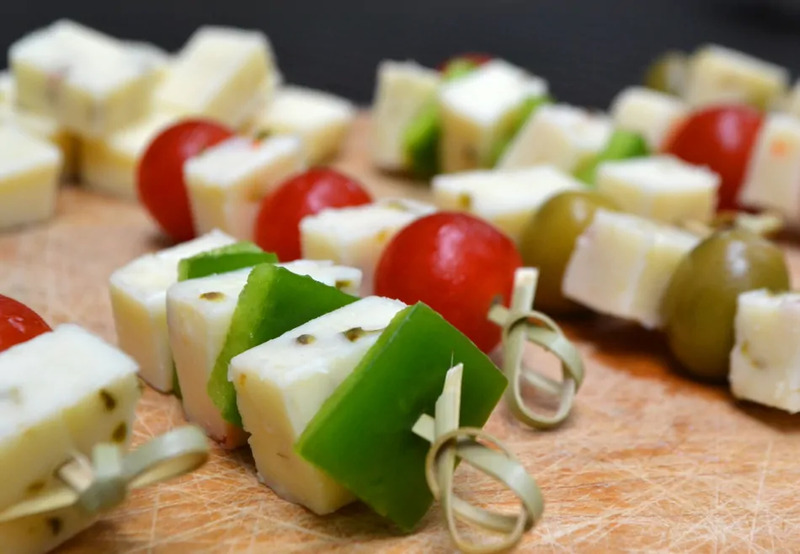 Chunks of cheese with your favorite veggies on toothpicks or skewers always make an eye pleasing & delicious bite. Then there’s one of my all time favorite cheese combos. 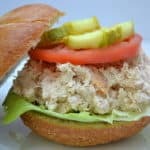 Tuna salad with cheddar chunks. 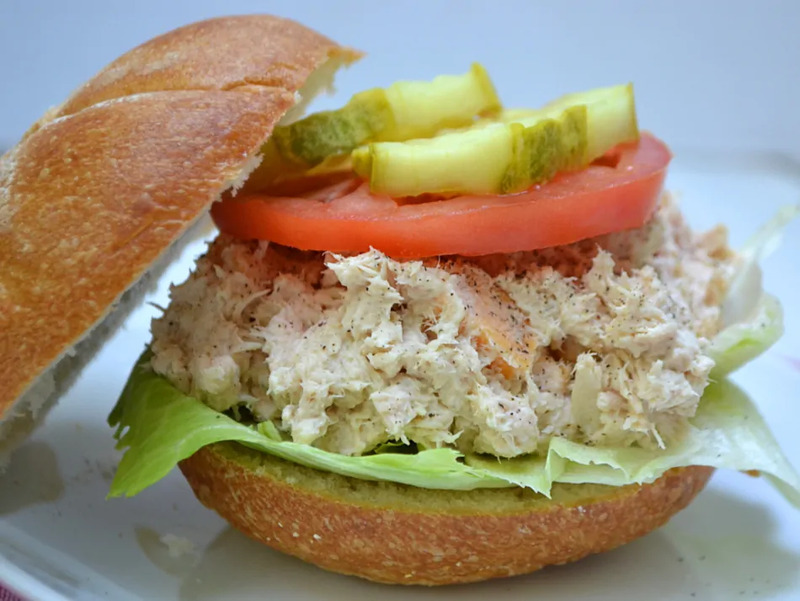 Tuna, cheddar, mayo & perhaps a bit of relish or hard boiled egg if the mood strikes. Mix it up, serve it on a roll and you just made simple sandwich perfection. Or serve it as a dip with chips & crackers. Try heating it up – melted cheesy goodness. Or skip the carbs and eat it in on top of sliced tomatoes, in a lettuce wrap or on top of a green salad. Any way you eat it – it’s delicious. 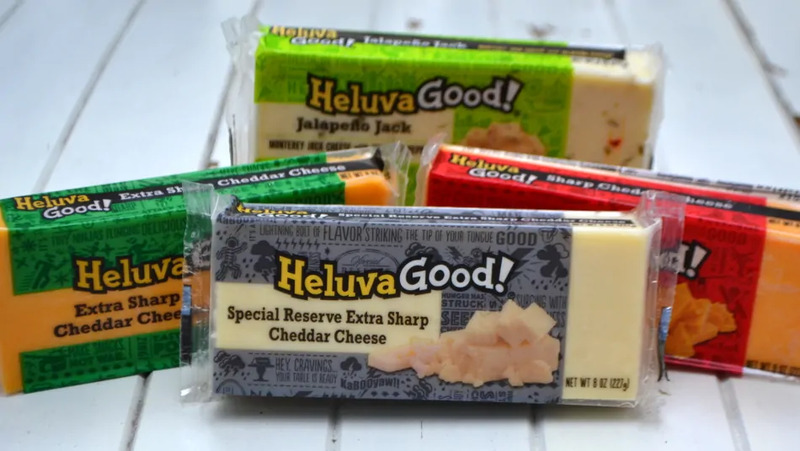 I love ALL the Heluva Good!® Cheese flavors! I always keep a few packs of Heluva Good! 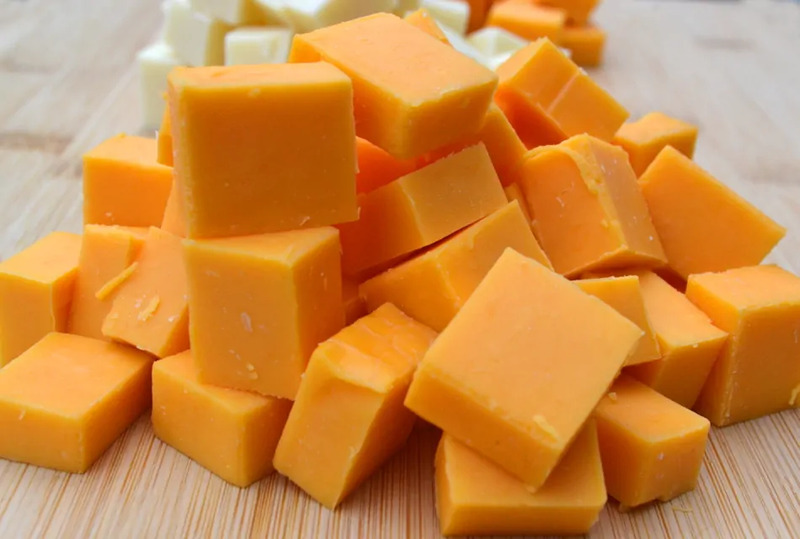 Block Cheese in my fridge for a solid snack with BIG flavor. Not only is Heluva Good loaded with flavor – it’s also a pretty “good for you” snack. Made with milk and always gluten free – Heluva Good is loaded with calcium, lots of protein and no trans fat. It’s great to feel good about your favorite foods! The cheese combinations you can create are endless! Grilled cheese galore, an omelette oasis or try your favorite fruits paired with cheese. Oh, and don’t get me started with cheese quesadilla ideas – I make breakfast, lunch, dinner & dessert variations! Visit Heluva Good! for more info, inspiration & all things cheese! Are you using Ibotta yet? Grab this Heluva Good! 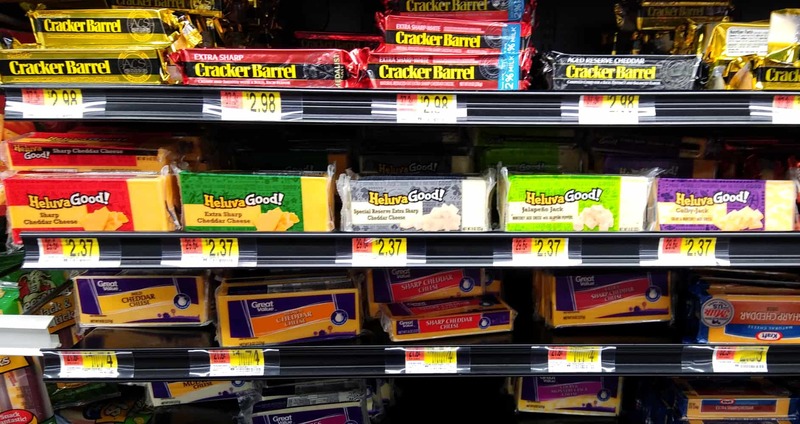 Cheese at Walmart Ibotta Offer! 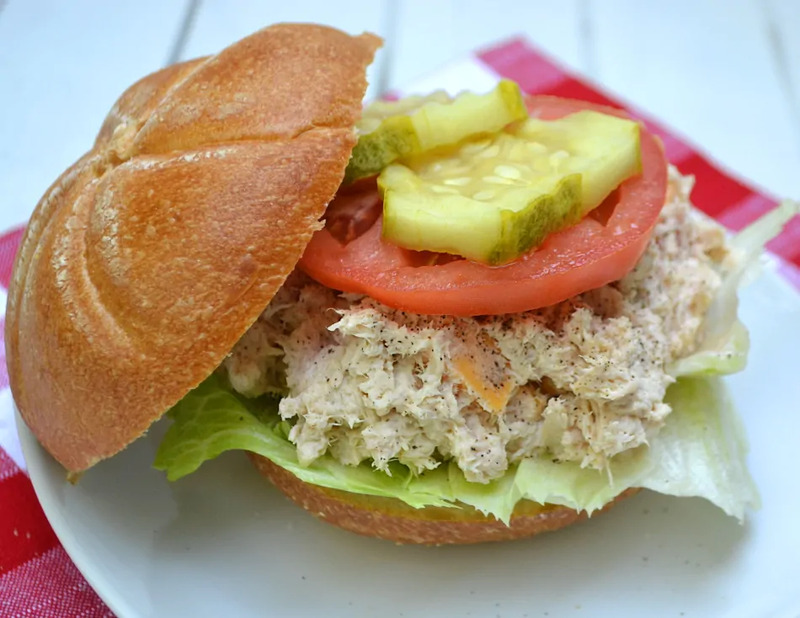 Try a simple twist on a classic recipe with this Cheddar Cheesy Tuna Salad. Mix together all ingredients and stir to combine. Add diced celery, onions, hard boiled eggs, pickles or relish if preferred. 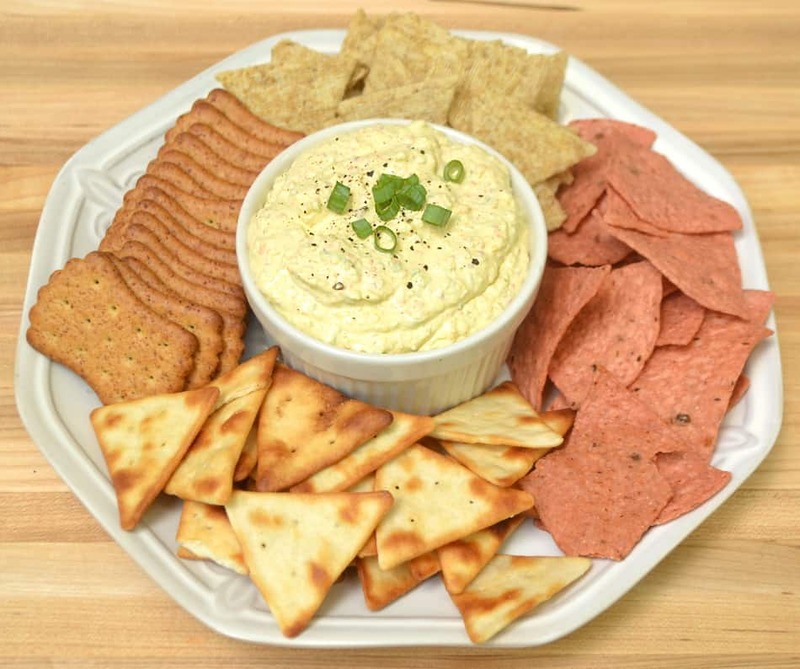 Serve on a roll or as a dip with chips & crackers. Try heating it up - melted cheesy goodness. Or skip the carbs and eat it in on top of sliced tomatoes, in a lettuce wrap or on top of a green salad. I found an awesome selection of Heluva Good! Cheese at my local Walmart store! Grab that Ibotta offer and head to your store today! 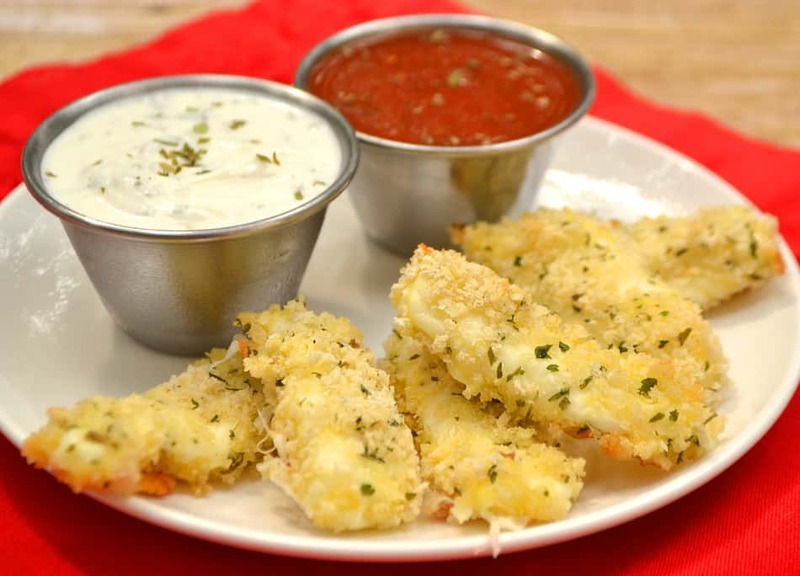 “Unfried” Baked Mozzarella Sticks – crunchy & gooey cheesy goodness without the guilt. Plus a healthy Greek yogurt ranch dip. Yay for healthy snacks! I have a confession to make. I am a fried food fanatic. Fresh cut fries, onion rings, fried pickles, fried mushrooms, fried seafood – and of course fried mozzarella sticks. Oh, how I love them all. I know better though. I don’t each much of it besides the occasional county fair when I go buck wild on the deep fried goodies. I’ve learned to enjoy some healthier alternatives to curb my fried food fixation. Fresh cut oven roasted french fries & sweet potato fries are in regular rotation in my house. For all the other fried goodies, I bread and bake them for the crunch without the fat & cholesterol. Fried Mozzarella Sticks are one of my all time favorites and luckily one of the easiest fried foods to make “unfried” at home. Roll the cheese sticks in some panko, give them a little freezer time and throw them in the oven. Crunchy, cheesy gooey goodness. Guess what…? 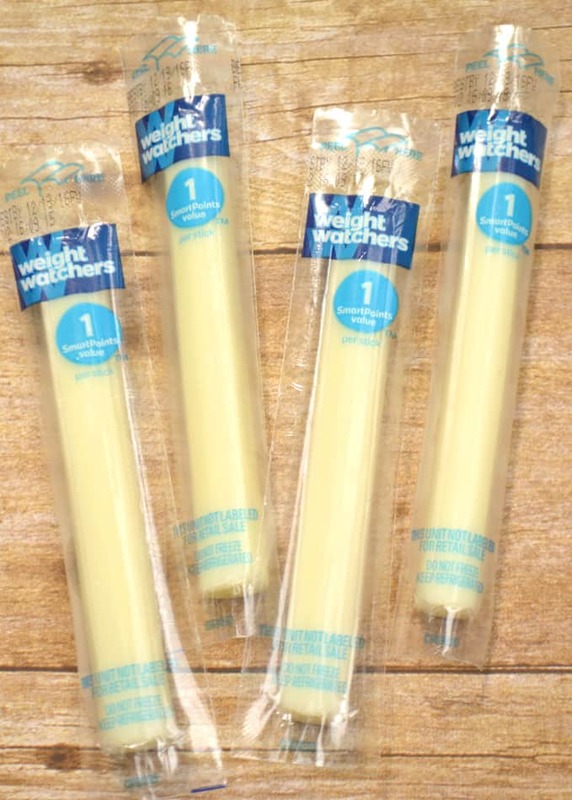 I made this snack even healthier with Weight Watchers Light String Cheese. With half the fat and 25% less calories of regular string cheese I can enjoy this lightened up snack and feel even better about eating it. Want to spice it up a little bit? 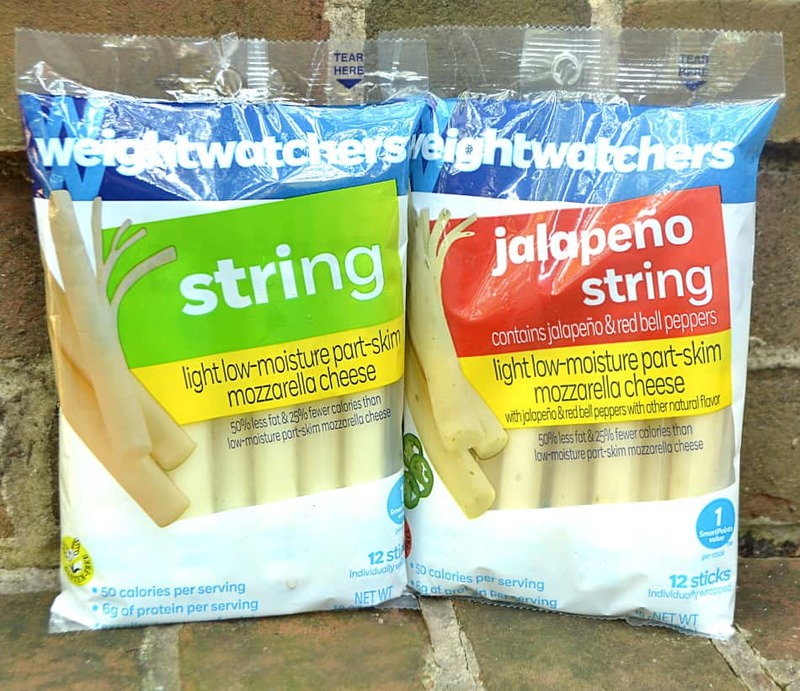 Then throw Weight Watchers Jalapeno Flavored String Cheese into the mix. 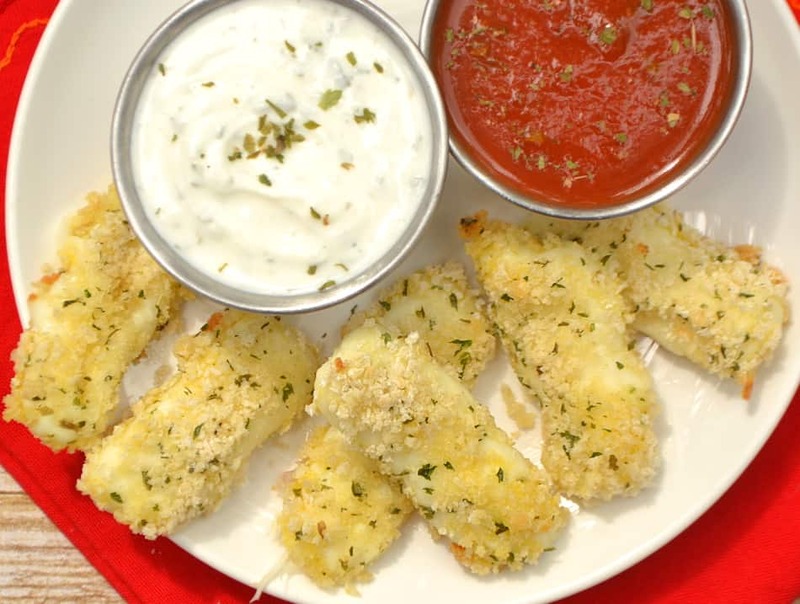 Think jalapeno popper mozzarella sticks. Yummmm. Know what every fried or oven baked snack needs? Something to dip that crunchy goodness into. 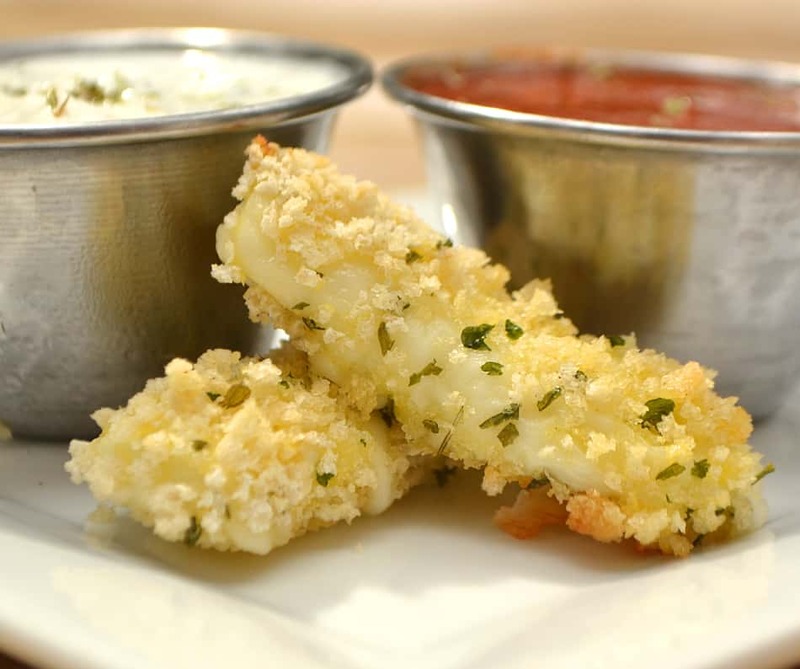 Marinara sauce with mozzarella sticks – that’s a given. Ranch dip – you better believe it. I’m a ranch dressing enthusiast but I’m not so enthusiastic about all the fat & calories that are in a serving of it. I’ve improvised with a Greek yogurt ranch dip. 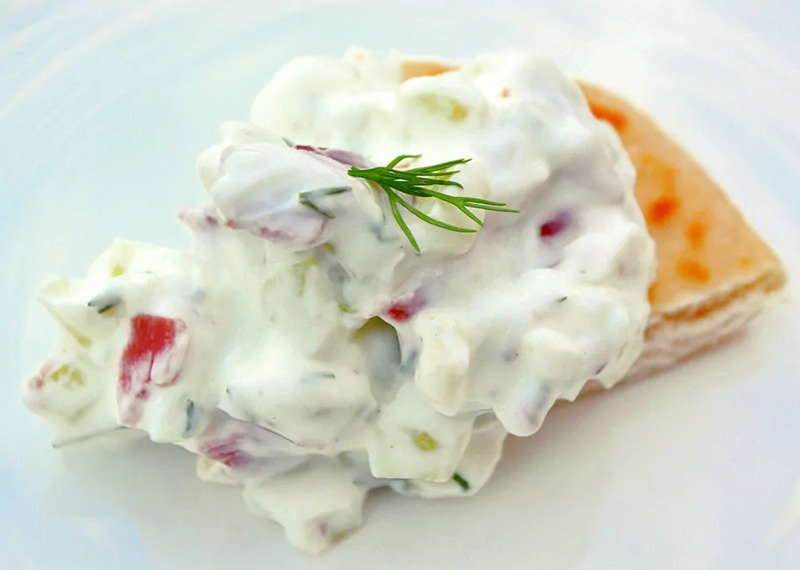 Stir a few herbs & spices in a cup of yogurt and you got yourself a ranch dip loaded with flavor and protein and fabulously low in calories & fat. I hope you enjoy this “Unfried” Baked Mozzarella Stick. I love food and I’m not into cutting favorite foods out of my diet. 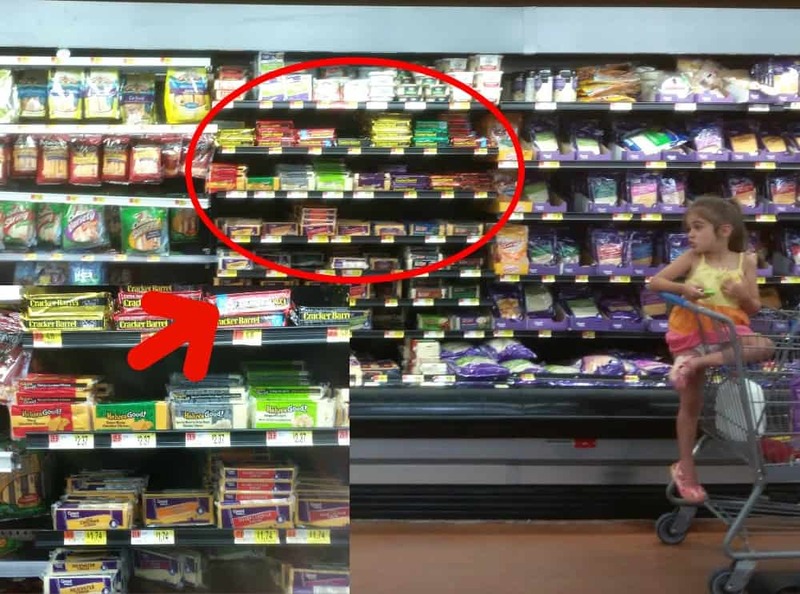 It’s great to have healthier options so we can enjoy the snacks we love more often. Thanks for stopping by! 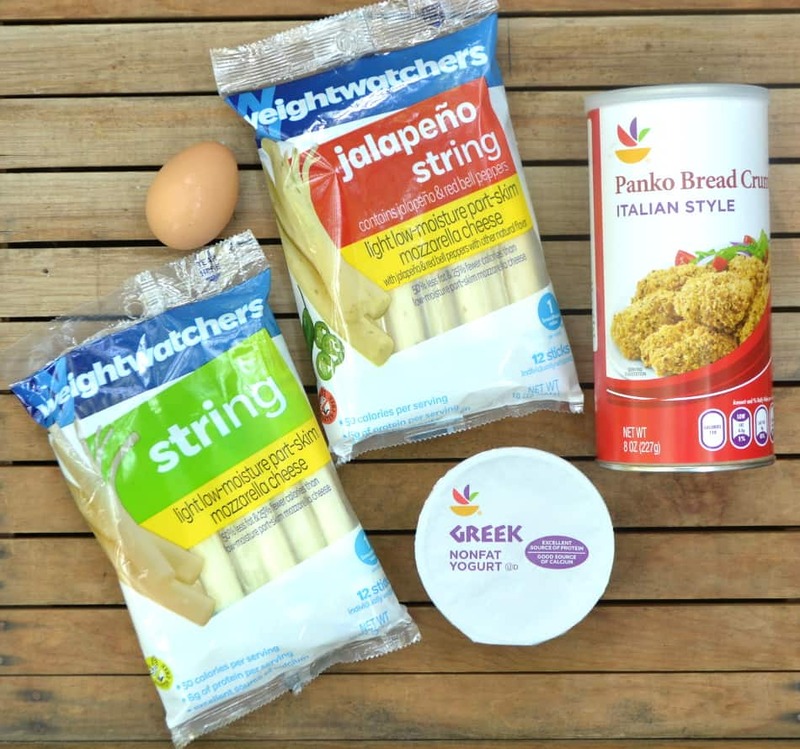 I found these awesome Weight Watchers products and everything else I needed to create this healthy snacking recipe at my local Giant Food Stores. Stop by your local Giant Food Stores between 9/1/16 – 9/28/16 and when you buy any (5) FIVE participating Weight Watchers products (excluding Heinz SmartOnes & Meeting Room Products) you’ll Save $3.00 instantly while supplies last! 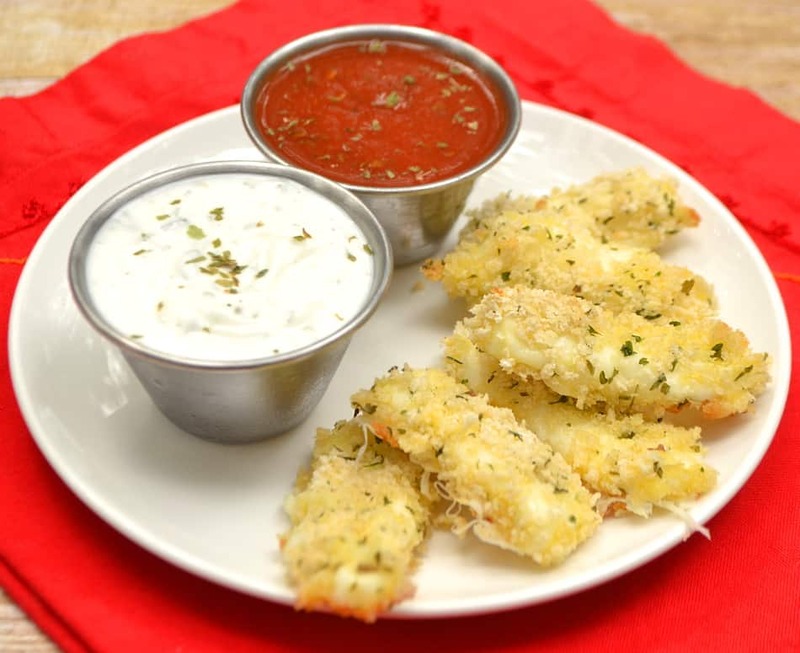 Crunchy & delicious baked Mozzarella Sticks. Cut sticks of string cheese in half. Set aside. Crack egg in a small bowl, beat. In a separate bowl combine panko, flour, parsley, garlic powder & salt. 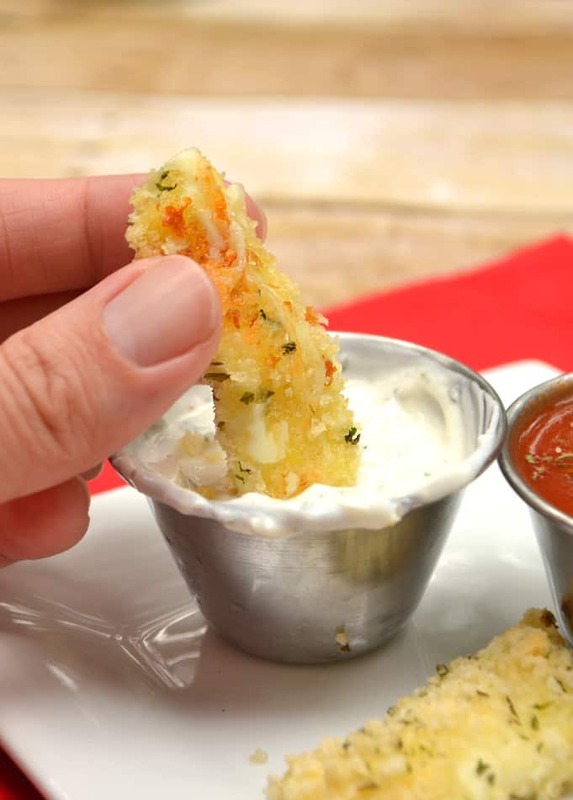 Dip a piece of string cheese into egg, then into panko. Press panko onto all surfaces & ends of cheese. Place breaded cheese stick onto wax paper lined plate and repeat with remaining pieces. Freeze breaded cheese sticks for at least half an hour. These can be made days ahead of time and kept covered in the freezer. Line a cookie sheet with aluminum foil and spritz with olive oil. Place breaded cheese sticks on cookie sheet. Spritz tops with olive oil. Bake until tops are light golden brown - about 8-12 minutes. Love ranch dressing but don't love all the junk in it? 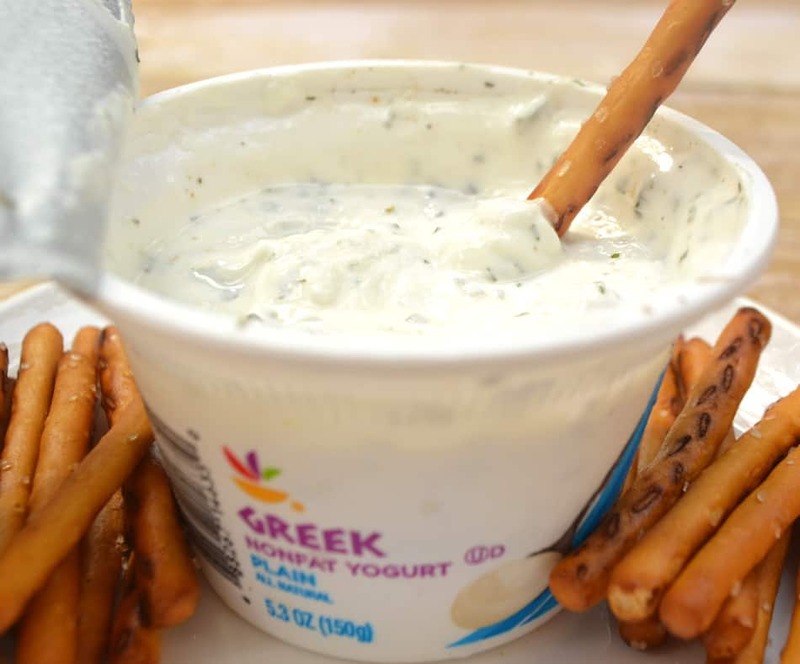 Try this Greek yogurt ranch dip - loaded with flavor and protein and light on the calories & fat. A healthy dip! Combine all herbs and spices with Greek yogurt. Refrigerate for at least half an hour before serving - allowing flavors to blend. Summer comes only once a year! I like to make the most of these beautiful sunny days and keep life as simple as possible. With so much outdoor work to do (in addition to all the normal day to day tasks) indoor chores get cut back. Extensive cooking & baking goes south for the summer – I try to keep the food and drinks easy. Fresh, simple, laid back food for mostly laid back days. The joys of summer bring fresh veggies. Some of us garden, some of us grab it from a local produce stand or market. Either or – it’s here, it’s in abundance and it’s just begging to be tossed into every dish imaginable. Nothing beats local produce, and for many of us, this season is only a few short months each year. I have a stockpile of quick and easy recipes to get our fill of summer veggies in. This Veggie Spread is one of my favorites. It’s simple and can be easily made to your tastes and with whatever veggies you have on hand. Chop up some veggies, toss everything in the food processor and your spread is ready! I’m a big tea drinker, hot and cold, and love it in all shapes and forms. 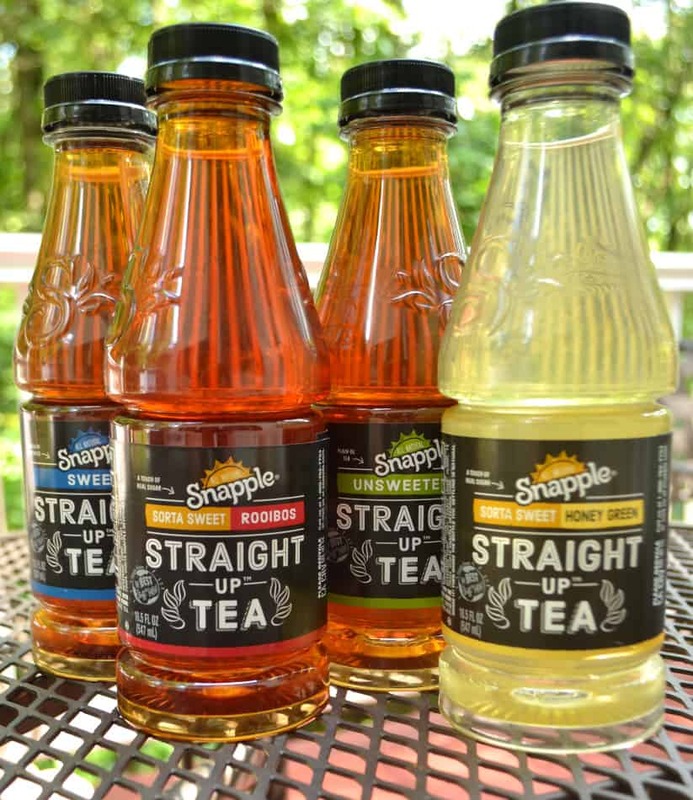 I enjoy brewing my own iced tea but it seems supply just can’t meet demand in my home during the summer season, so I keep my fridge stocked with Snapple® Straight Up™ Tea. I love this stuff! Made with all-natural ingredients – nothing artificial – it has everything you need in it and none of the stuff you don’t. This tastes like iced tea is meant to taste! 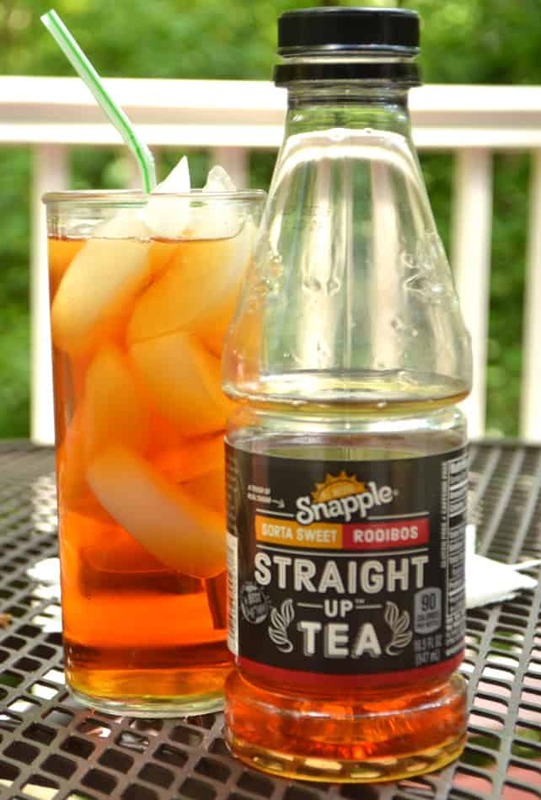 I’m so excited about the two new varieties – Snapple® Straight Up™ Tea Rooibos and Sorta Sweet Honey Green Tea. Both these teas are light, tasty and refreshing – perfect for sipping any day! Enjoy all the tastes of the season and live that laid back summer living! 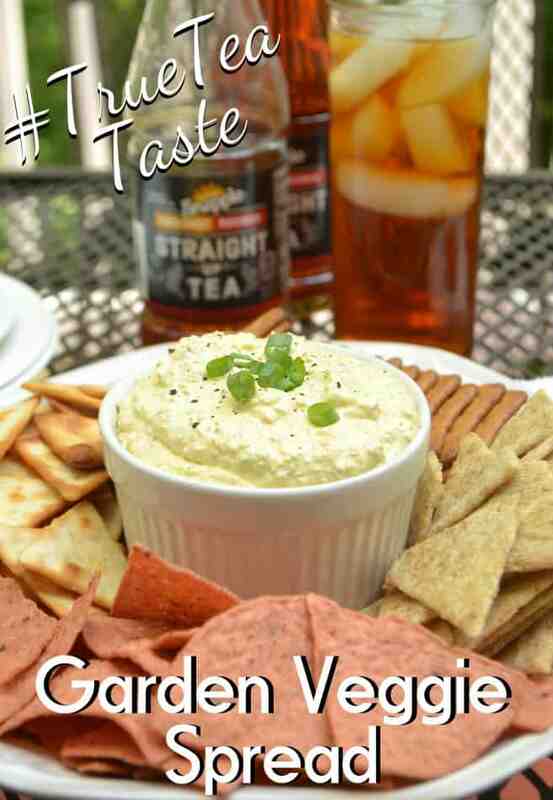 A quick & easy spread / dip using fresh garden veggies. 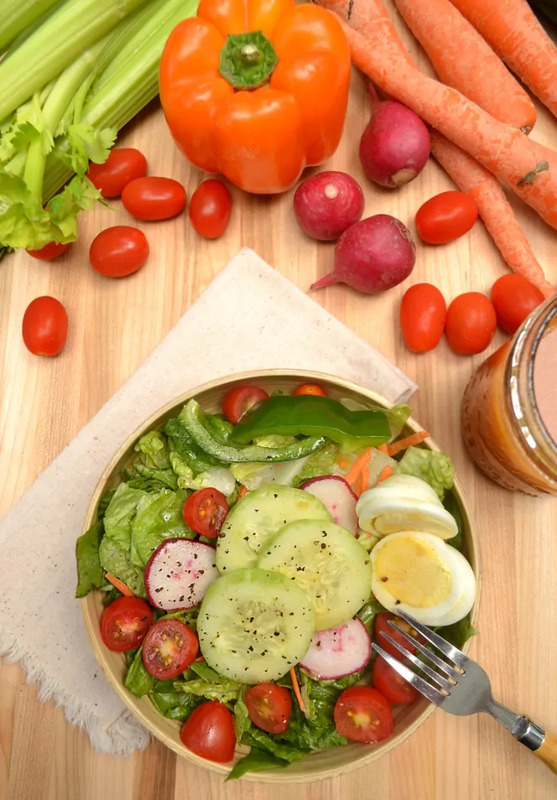 This recipe is easily adaptable - use your favorite veggies, herbs and spices to create your own perfect Vegetable Spread! I often add more onions & garlic for myself or add whatever herbs are growing in abundance. Enjoy! Prep & chop all veggies. 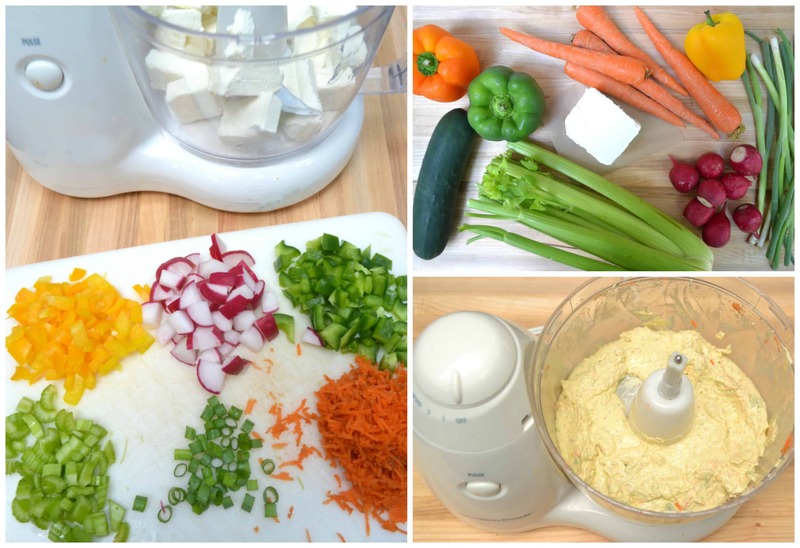 Place cubed cream cheese and all veggies into food processor. Pulse until desired consistency. If you want a chunkier spread, process less. If spread is too thick for your liking, a tablespoon or two of half and half may be added. Alternatively, if you didn't want to use a food processor, chop veggies finely or grate and stir by hand. Transfer spread to mixing bowl. Salt & pepper to taste, stir. Store covered in fridge for a few hours, allowing flavors to blend. 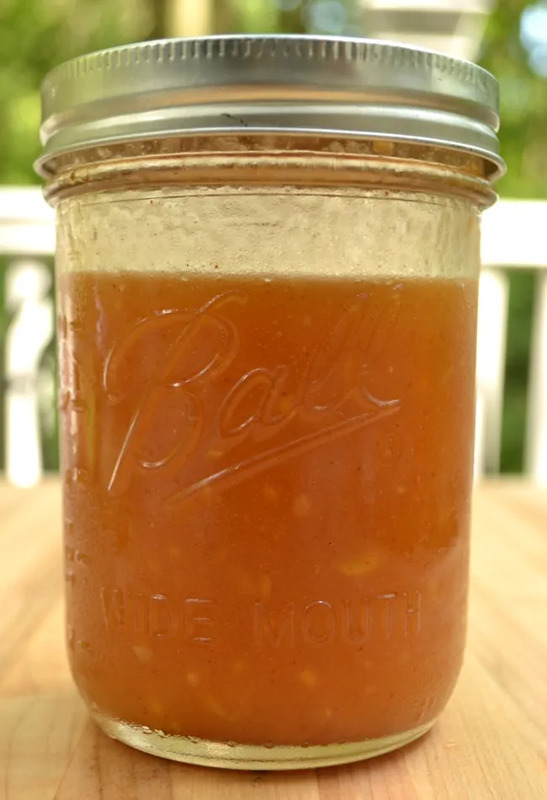 This crisp, sweet & tangy Vinaigrette made with raw honey & apple cider vinegar takes just a minute to mix together and keeps indefinitely. Great on salads & veggies! I love salads – simple garden salads, nothing fancy, nothing extravagant. 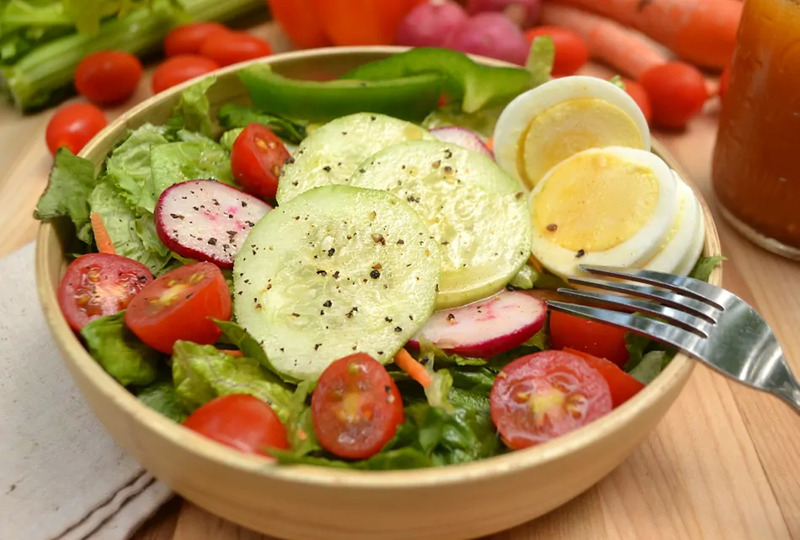 Crisp greens, a hard boiled egg and a handful of whatever chopped veggies I have on hand and my salad is complete. I enjoy salad dressings and at any given moment you’ll find an extensive selection of dressings – store bought & homemade – in my refrigerator. Although a simple balsamic & oil will always be my favorite, I appreciate fresh flavors. It keeps my simple salad habits exciting. What many of you may (or may not) know is that I am a bit of a homesteader. I have a nice size flock of happy free ranging hens who give us more eggs then we could ever possibly use. So many that my 10 year old is starting an egg sale & delivery business from her wagon this summer. My husband and I have our hearts set on beekeeping. With so much going on and a never ending list of “around the house” projects, it seems beekeeping got pushed back on the list for another year or two. That’s okay, though. We’ll get to it when it has our full attention. It gives us more time to do even more research and will allow me to thoroughly read & reread George Imirie’s Pink Pages – pretty much the East Coasts beekeepers bible. So until my own honeybees are producing honey in my backwoods hive, I buy my raw honey from a few responsible local beekeepers. I love honey – I love the flavor, I love the color, I love the consistency, I love the beauty of it. I enjoy it in my tea, I love cooking & baking with it and I love drizzling it over baked goods and pastries. 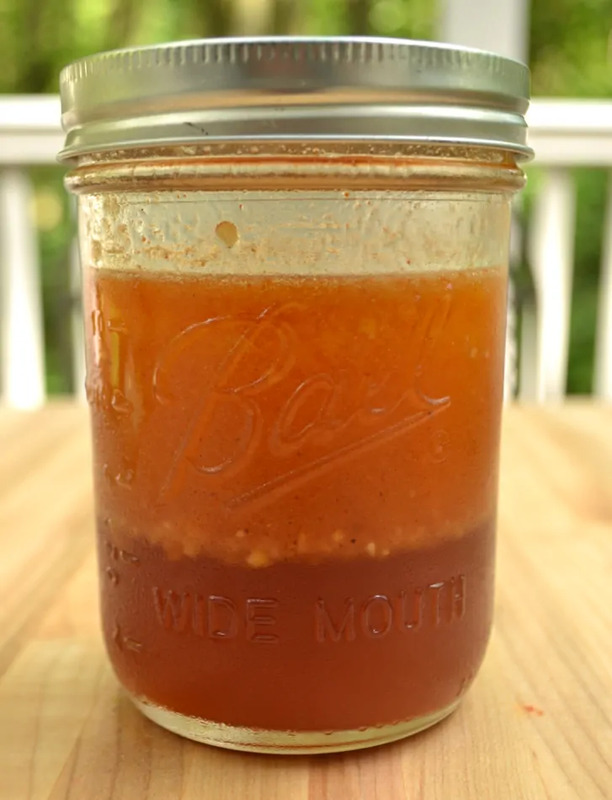 Oh – and I love making a simple vinaigrette out of it. This isn’t one of those super thick & sweet dipping type dressings that everyone seems to associate a honey salad dressing with. 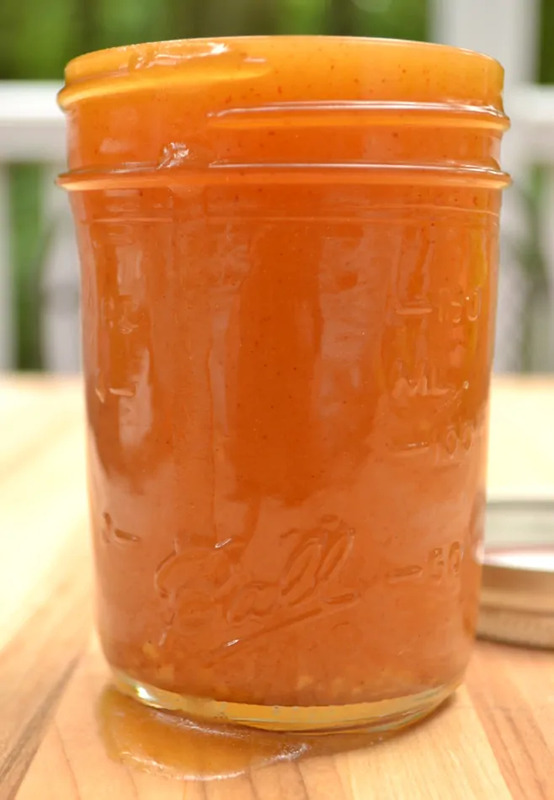 This is a crisp and tangy light vinaigrette with just the right amount of sweet honey flavor. Throwing it together is beyond a breeze. Everything goes into a mason jar, gets capped and given a good shaking. Refrigerate until ready to serve and shake before serving – ingredients do separate. That’s it. 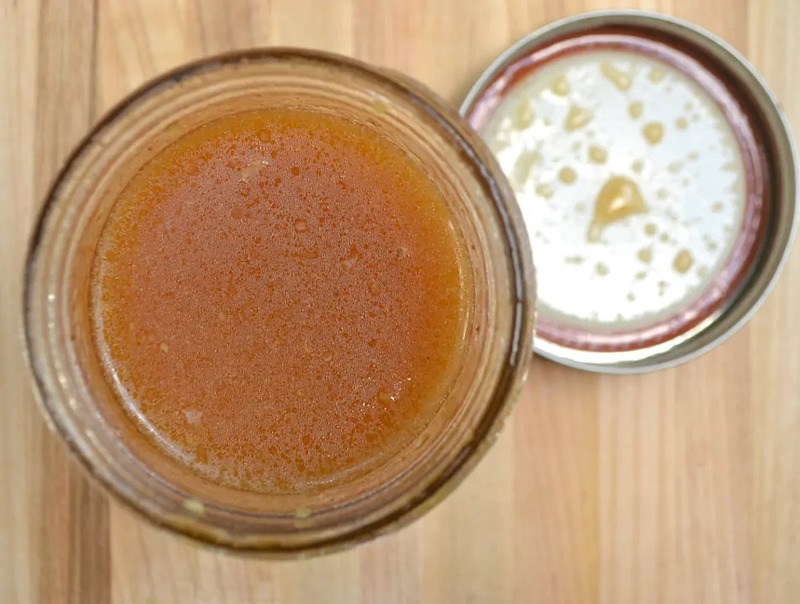 An easy summer salad dressing made with local honey. This stuff will keep for quite some time – but I’m sure the honey lovers will get it used up in no time. Combine all ingredients in mason jar and shake thoroughly until everything is combined. Shake before serving, ingredients will separate. 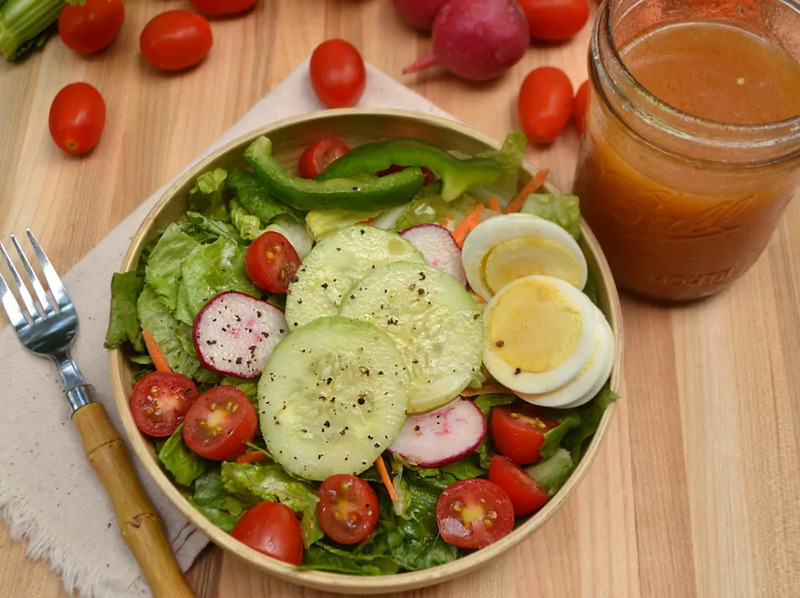 Enjoy on salads & with fresh veggies. This dressing will keep for quite some time in the refrigerator. White Bean Dip with Roasted Garlic, Olive Oil & Lemon Juice. 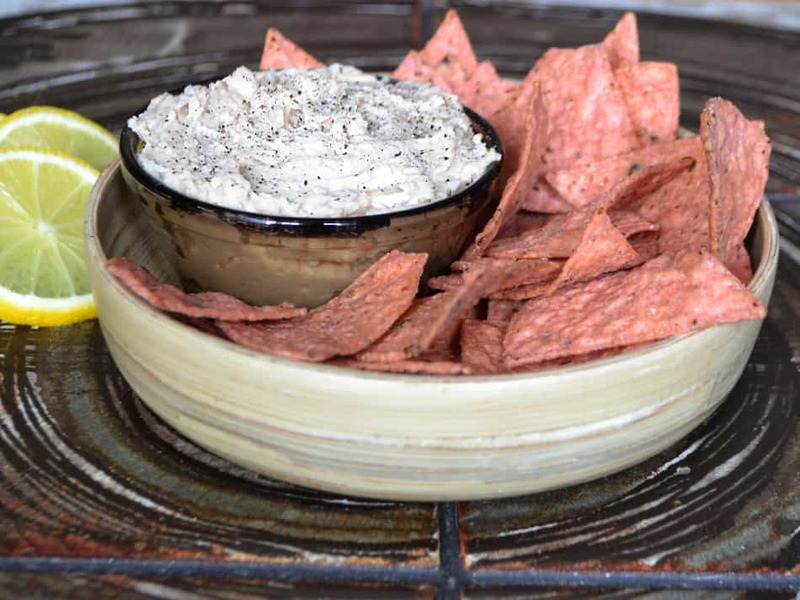 This dip is a quick, easy, delicious, healthy, vegan snack! The last few recipes I’ve shared have been simple, quick and have required only a handful of ingredients. I’m sticking with that theme today. 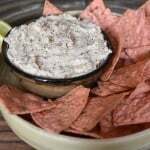 This is a dip I make often. It’s a simple and healthy snack (or lunch) made with ingredients I always have on hand. It takes just a few minutes to whip up and it’s super versatile. Add some fresh herbs to liven it up if you’d like – fresh mint, parsley, basil, dill – whatever you love. Let’s talk roasted garlic. It really is wonderful, it almost transforms as it’s roasted. A chef buddy told me that roasted garlic is one of the least recognized yet favorite flavor in many of his dishes. That took me for surprise – not that people love it, but that people aren’t familiar with the flavor. It serves as a reminder of how varied foods and flavors are region to region here in The US. Foreigners love to use the quote “American Food” without realizing how vast America is. How much of a melting pot it really is. Three cities, off the top of my head – Boston, New Orleans and Albuquerque. Visit all three, sit down and enjoy the local cuisine. Good luck finding similarities in said “American food”. 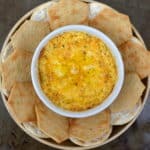 I serve this dip with baked tortilla chips – but it’s great with veggies, pitas, crackers – all your normal dipping vessels. Oh, and as much as I sing praises on roasted garlic – if you don’t like it, that’s okay too. 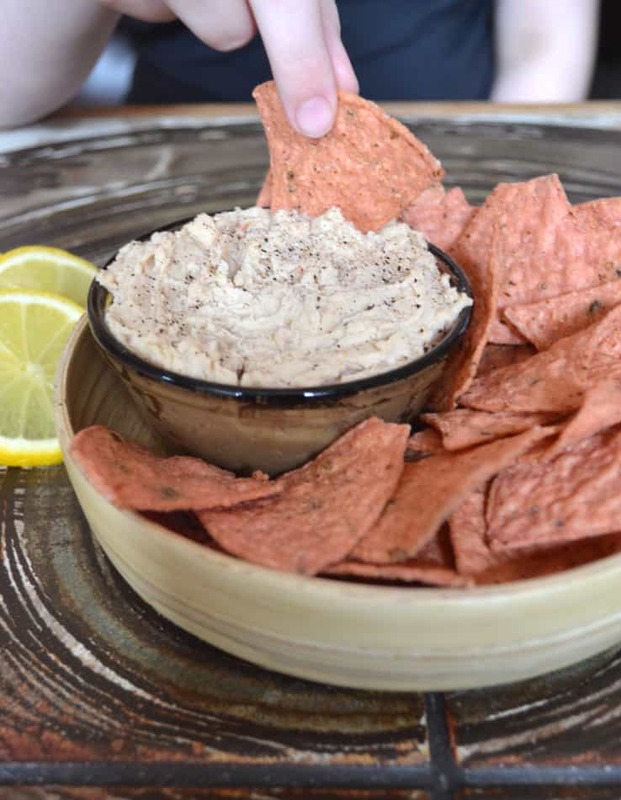 You can use just about anything you’d like to flavor this dip – white beans have a super mellow flavor. Sun dried tomatoes, black olives, roasted peppers, cheeses, cilantro – get creative! 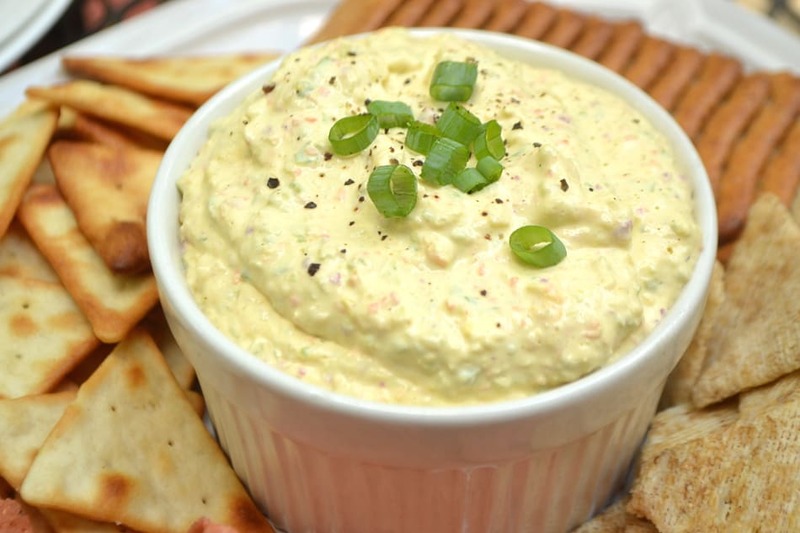 I hope you love this quick & healthy White Bean Dip! Thanks so much for stopping by – Happy Cooking! 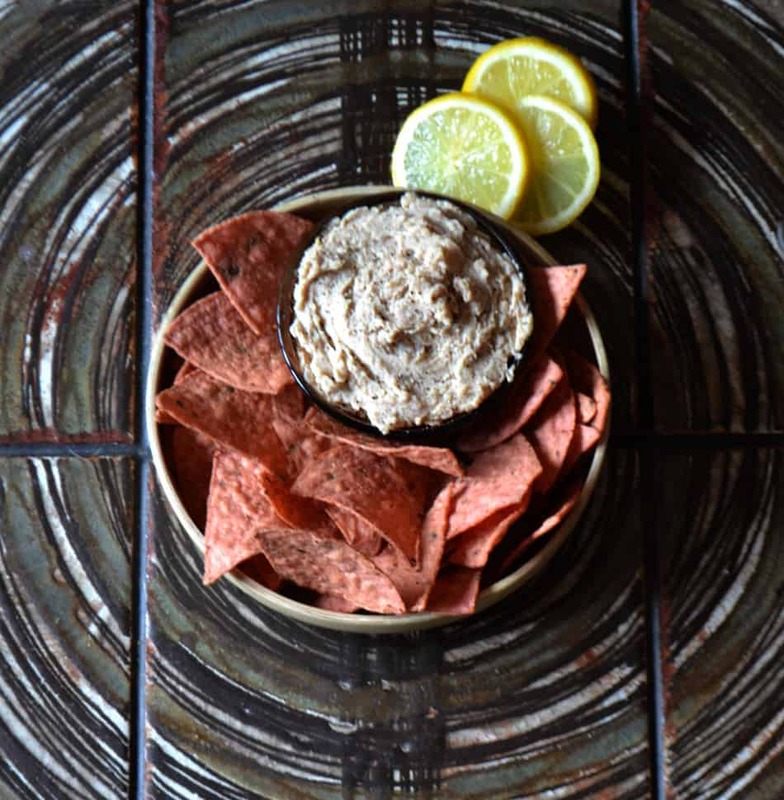 White Bean Dip w/ Roasted Garlic, Olive Oil & Lemon. Quick, Easy, Delicious, Healthy, Vegan Snack. Drain beans and rinse thoroughly in a colander. Add white beans, roasted garlic and lemon juice to a food processor. Run until smooth, drizzling in olive oil. Stop once or twice to scrape down sides if necessary. 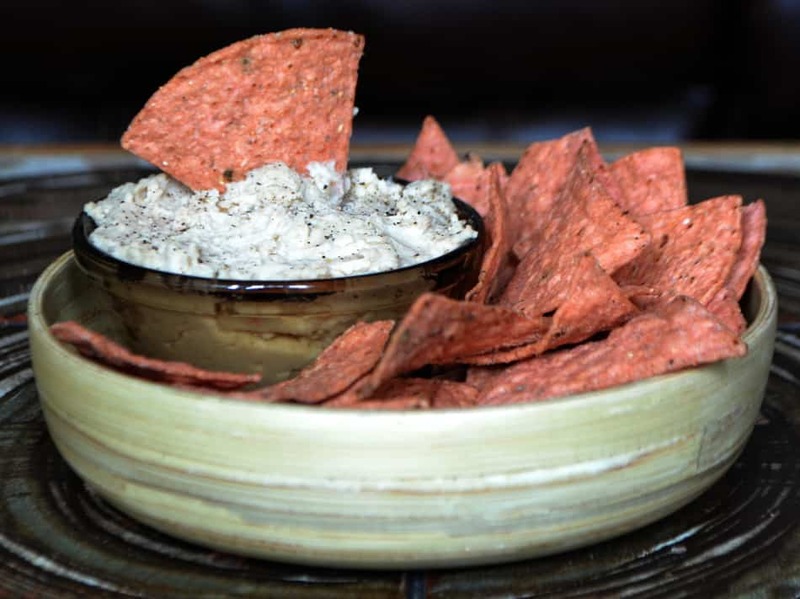 Crack pepper over dip to taste, serve with tortilla chips or veggies. Enjoy! I prefer this dip at right after it's made. If making it ahead of time and refrigerating, it's best to bring it to room temp before serving. 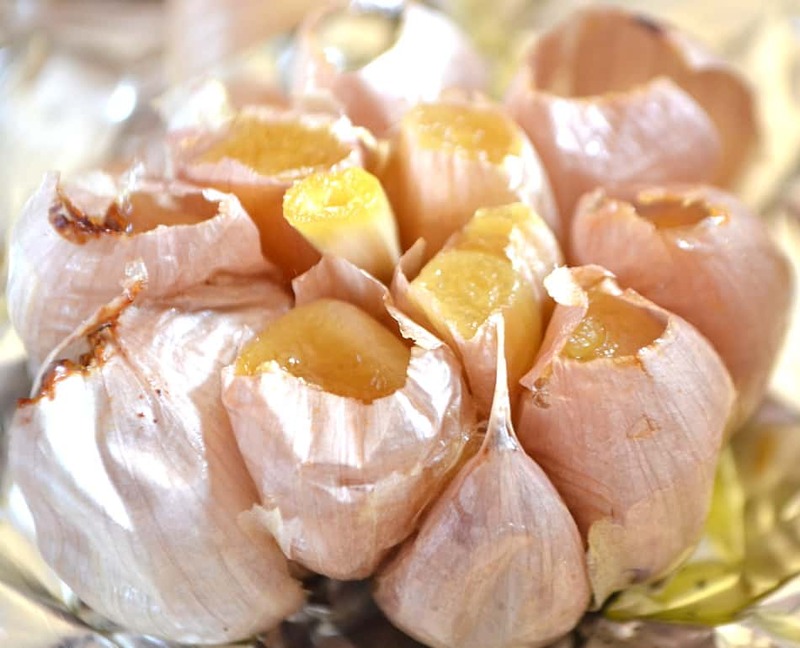 *For roasted garlic : Trim tops (about 1/4") off garlic bulbs and peel off any papery skin that's easily removed. Some will still be on. Place on an appropriate size sheet of aluminum foil. Drizzle olive oil into the bulbs. I eyeball amounts, but I think a tablespoon would be about right. Wrap up in foil and roast at 400° for about 45 mins - 1 hour. If you're running your oven a little hotter, that's fine, just check your garlic a little earlier. This is a sponsored post written by me on the behalf of Knauss Foods. All opinions are completely my own. Who doesn’t love a gyro drenched in tzatziki sauce? 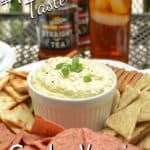 I’ve created a simple, yet authentic tasting, Greek Gyro Dip using Knauss Dried Beef! When I say dried beef, what is the first thing thing that comes to mind? I bet most of you think of Creamed Chipped Beef. Rightfully so, it’s an all American comfort food. Drench that gravy goodness all over fried potatoes and toast and it’s home cooking breakfast heaven. Let’s forget about Creamed Chipped Beef and talk some more about dried beef. Dried Beef is a slow cured, lean beef which is mildly salty, yet beefy and smoky. These 100% beef slices from Knauss Foods are gluten free, contain no MSG, and are 98% fat free. Loaded with flavor and ready to go. I love the convenience of a quality ingredient that involves no kind of prep work. Pull a pack or two out of your fridge and get creative at meal time! After tasting it straight from the pack, I realized it could be added to a variety of snacks, dips, appetizers and foods. 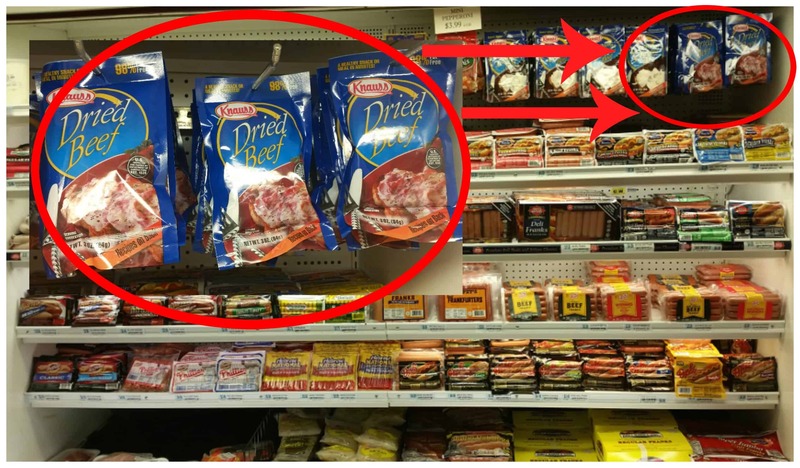 Still not sure if you’re familiar with dried beef? You’ll find it in your grocers refrigerated section with luncheon meats, hot dogs or maybe even breakfast potatoes. Let’s talk about snacks. Between the holidays and football we are all doing a lot of entertaining and visiting. 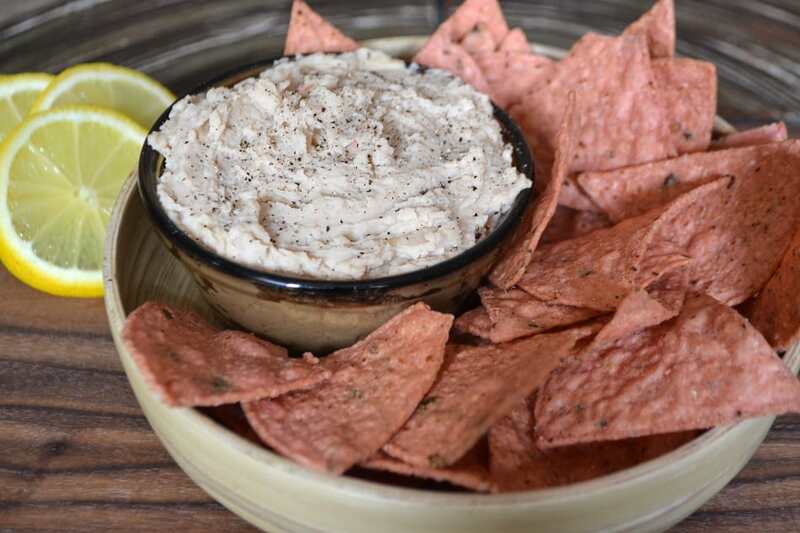 Snacks are a definite – dips are a must. Really though, dips are becoming more & more predictable. I enjoy the classics as much as everyone else – but there’s only so much Buffalo Chicken Dip or Spinach Artichoke Dip I can handle. I decided it was time to take my dip game to the next level. Often my inspiration for creating a recipe is attempting to duplicate or even simplify a dish I love. The instant I nibbled on a piece of dried beef one thought popped straight into my head. Gyros. I absolutely love a gyro. I’ve never attempted to make them at home because I don’t have the set up to make shaved lamb. 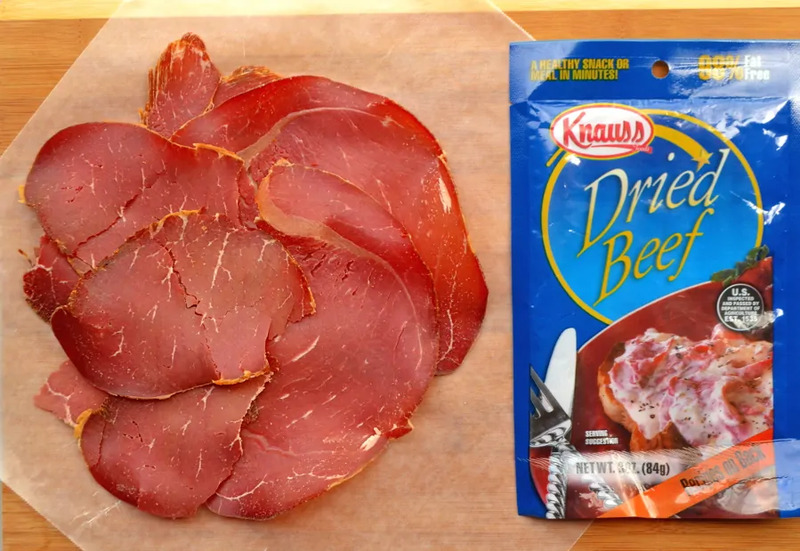 Knauss Dried Beef made the perfect substitute for the shaved lamb! The most work you’ll do when making this dip is fussing with the cucumbers. I’m all for keeping things as simple as possible, but cucumbers tossed in this dip “as is” will result in a watery mess of a dip. No one wants that. Seriously – I drained almost 1/4 cup liquid from the cucumbers. To solve the cucumber dilemma, you’ll just salt and drain them. No real work is involved here, just an hour of resting time. After that, stir everything together. Done. 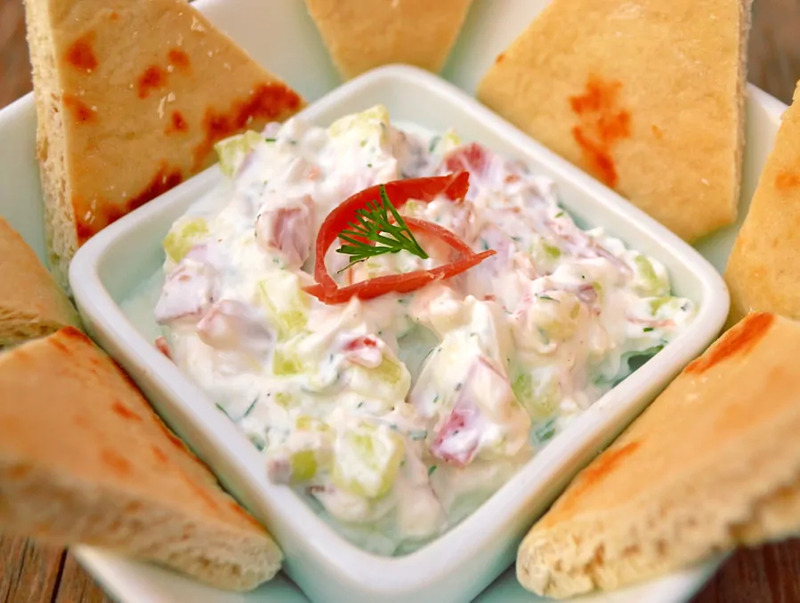 I served this dip with fresh pita slices, tomatoes and lettuce. No one bothered with the tomatoes or lettuce, instead the dip and the pita disappeared. Quickly. Everyone loved it – they all said it was like eating a mini gyro. Perfect – that’s exactly what I was going for! 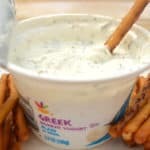 I’m so excited about how delicious and easy to make this Greek Gyro Dip is! 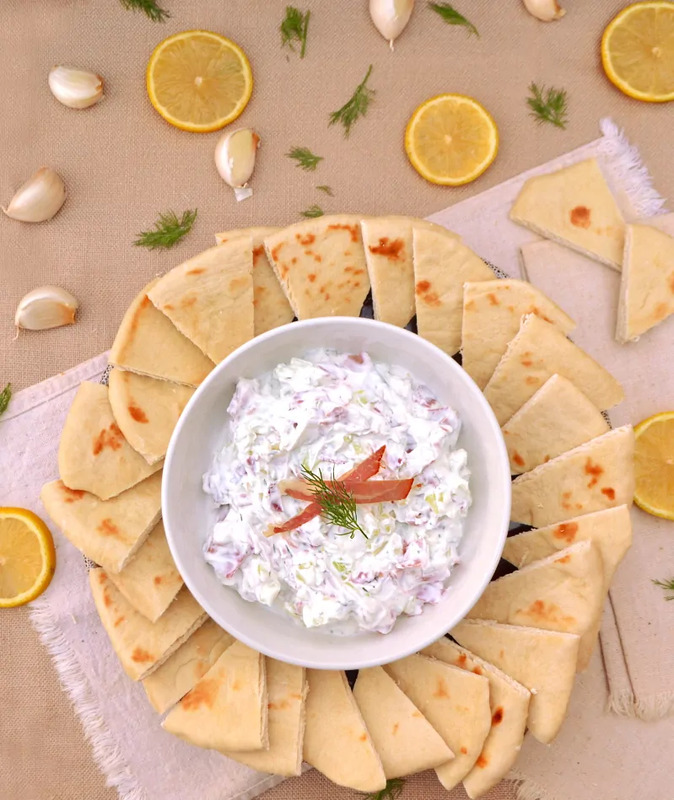 If you like gyros, this dip is a must try! If you’re tired of serving the same old snacks and dips to your guests – then this is an exciting new dip to make. There is so much more you can do with dried beef than just Cream Chipped Beef! Visit Knauss Foods for more information, recipes & inspiration! Who doesn't love a gyro drenched in tzatziki sauce? 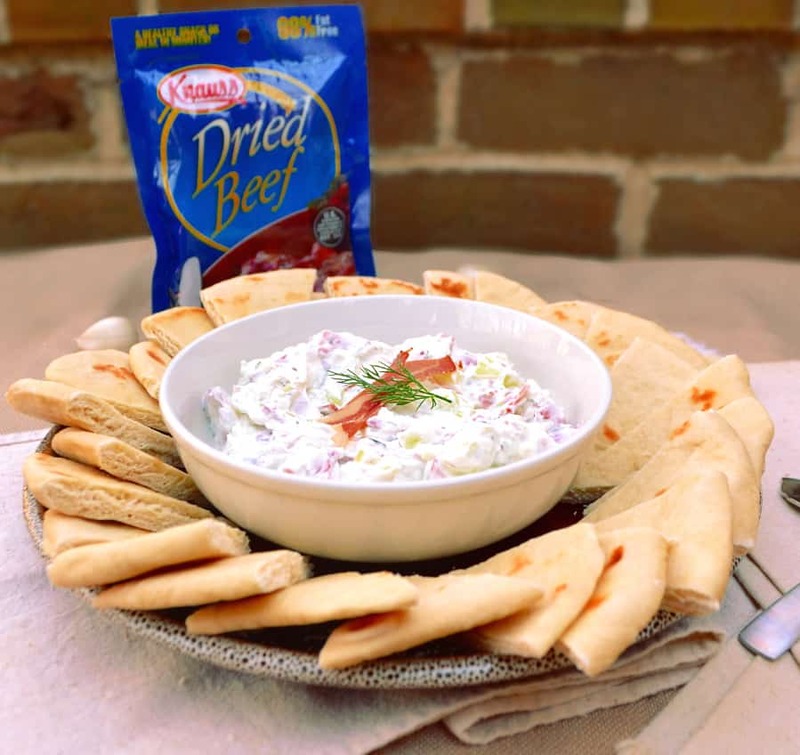 I've created a simple, yet authentic tasting, Greek Gyro Dip using Knauss Foods Dried Beef! 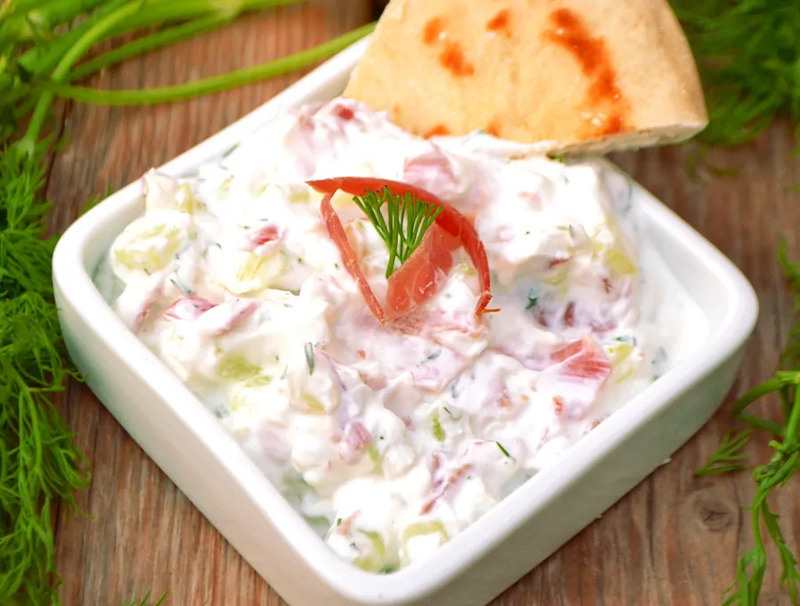 In a bowl, combine cucumbers, Greek yogurt, dried beef, garlic, dill and lemon juice. Stir. 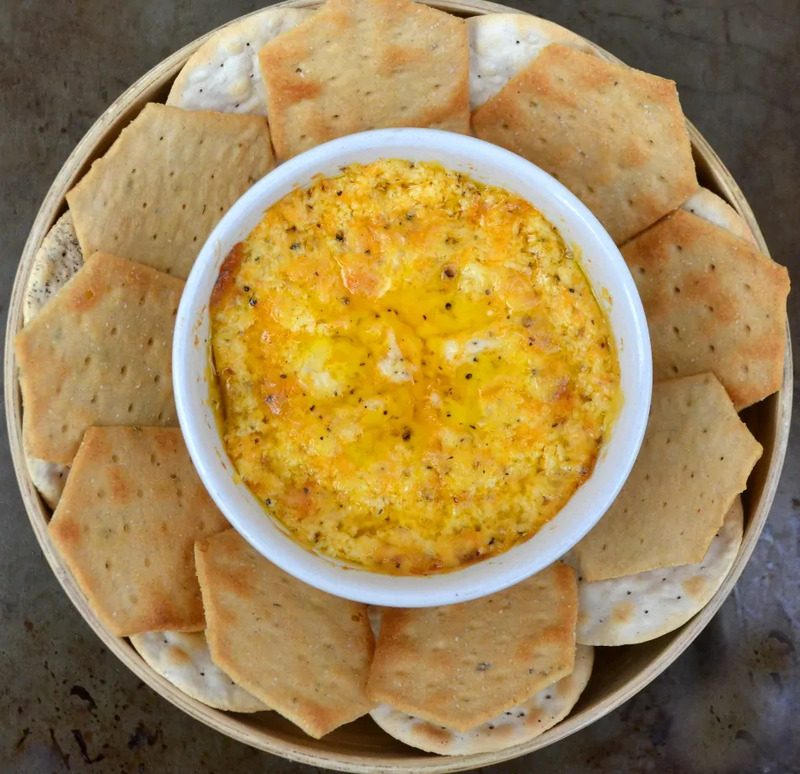 Dip can be served immediately, but is best after refrigerating for an hour or two to allow flavors to blend. Serve with fresh pita slices, flatbread or naan. Dip can be stored for a day or two in the fridge. If liquid starts to form (from those stubborn cucumbers), blot up with a paper towel & stir dip. Want to make your own pitas? Good for you! It’s pretty simple and will save you quite a few bucks! 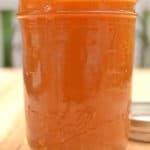 I don’t have my recipe posted quite yet – but I found a recipe super similar to mine. Visit Half Baked Harvest for their fabulous pita recipe! I love peanut butter. 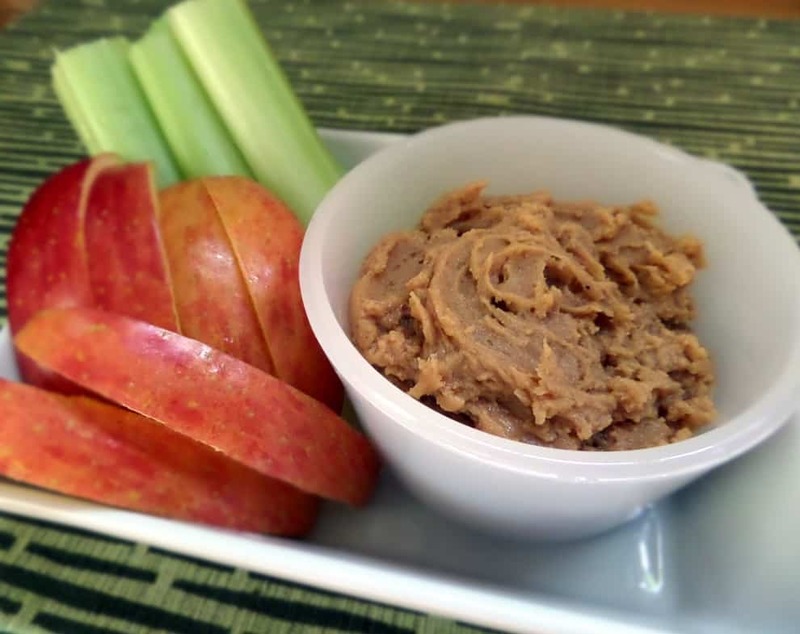 Smear a spoonful on a sliced apple or a piece of celery and it’s snack perfection. Throwing peanut butter on an apple for you and your kiddos is clearly no big deal. So why mess with perfection and what is this Peanut Butter Dip all about…? Here’s the deal. Peanut butter is creamy, healthy and delicious – but it’s also a pain in the behind to serve for a group. 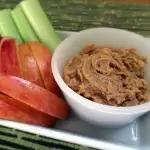 So if I want to serve a plate full of apple slices at a party – our beloved peanut butter is too sticky, not so dippable, and a bit of a pain to smear. In comes the Peanut Butter Dip. Good thing is – it’s still really simple. All your doing is adding a block of neufchatel or cream cheese, brown sugar and milk to the peanut butter. Admittedly it’s not as healthy anymore, but we’re not eating it by the spoonful here. Not usually, anyhow. We now have a delicious, spreadable and dippable peanut butter. Easy to serve and no sticky messes. Cut up your apples ahead of time to make this an effortless snack for entertaining. To prevent oxidation/browning – toss apples with the juice from a lemon or soak in a bowl of ice water with a tablespoon or two of lemon juice. 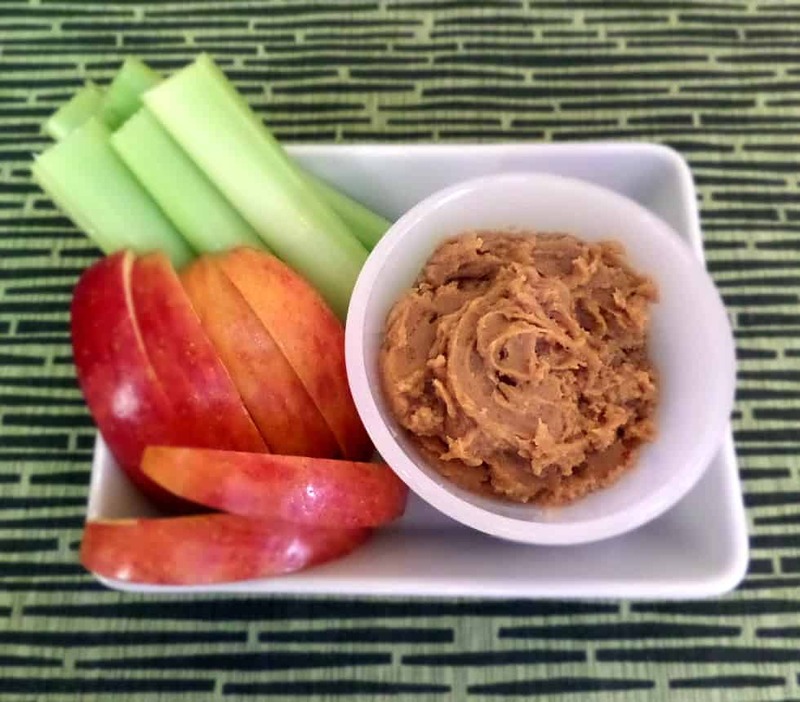 This dip really favors apples best, but celery comes in close. I look forward to our local apple season. 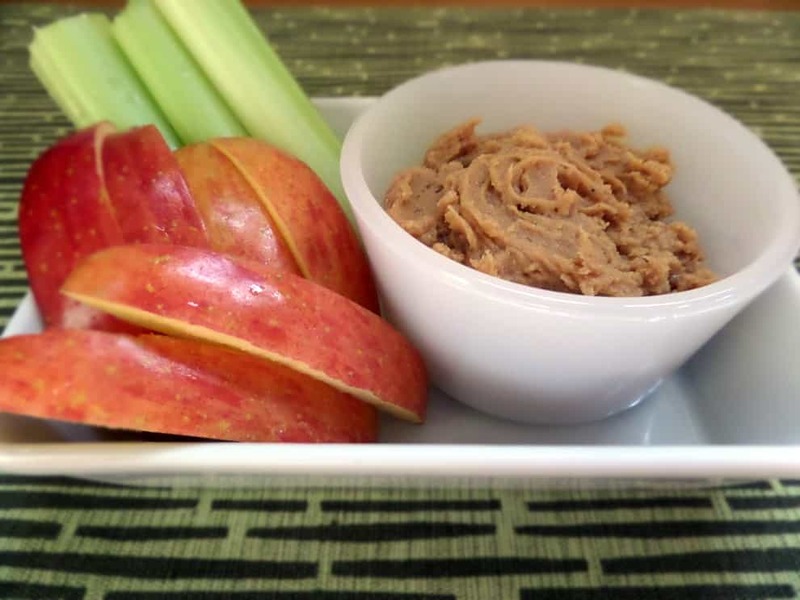 I pick up apples for less then .50 cents a pound – this dip is a great way to get all those fresh apples eaten up. 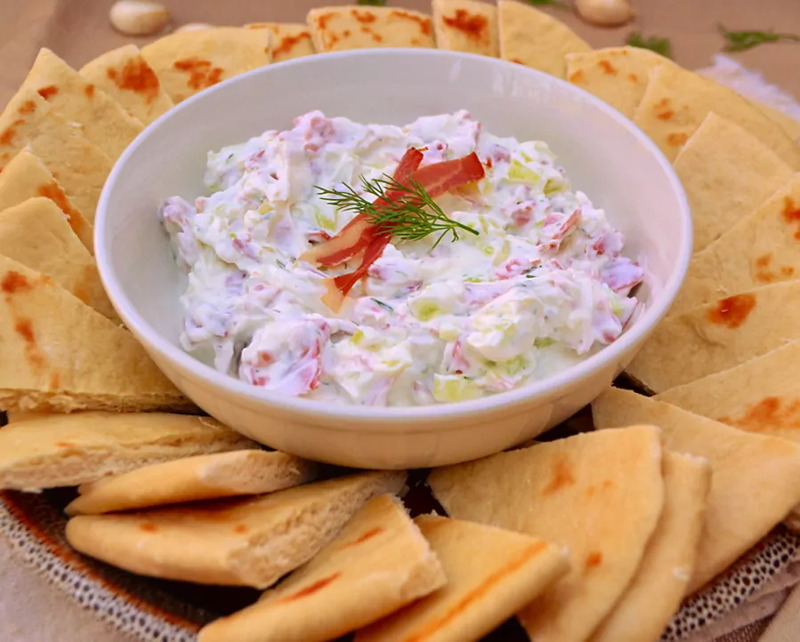 A batch of this dip goes a long way! Thanks for reading! 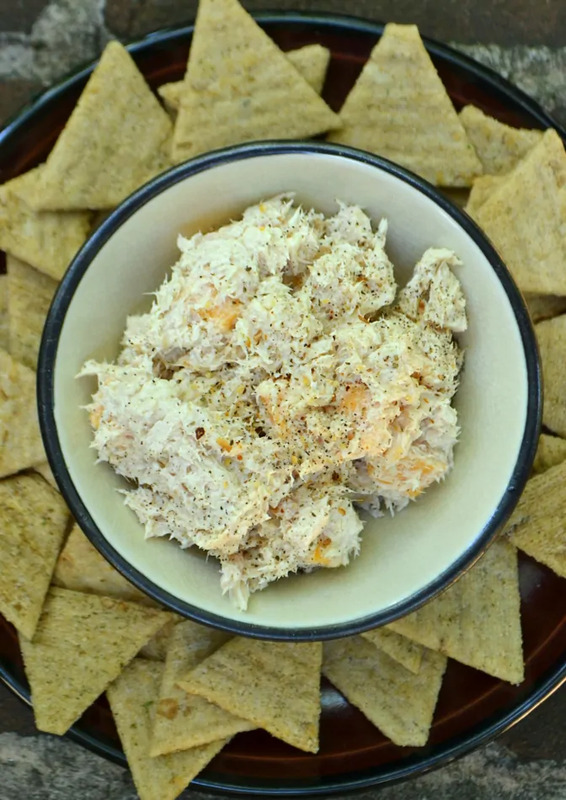 I hope you give this Peanut Butter Dip a try and I can’t wait to hear about it! A delicious, spreadable and dippable peanut butter - no sticky messes here. 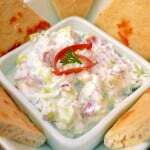 Easy to make, tasty with apples and celery - perfect party dip! Using electric mixers, combine all ingredients in a mixing bowl. Mix until smooth. Refrigerate until ready to serve. Serve with apple slices, celery, cracker or whatever else you'd like to accompany this peanut butter goodness. Enjoy!